I’ve loved this home for years, was on the site in 2011. The Georgia Trust is now hoping someone will save it. I kept a couple of 2011 pics, I can’t say the light is still there. Great fireplace, but that gorgeous medallion on the ceiling is to die for! This is the kind of project I really wish I had the capital to take on!! LOVE THIS PLACE! There was one hidden under a dropped ceiling! I wonder why it’s not showing for sale on the realtor websites? Beautiful house!! Because it’s not listed with an agent or in the MLS system. Not every home posted on OHD is. Okay, that makes sense. Thank you for clarifying! Are there any city grants available to restore property or tax incentives or like minded programs? 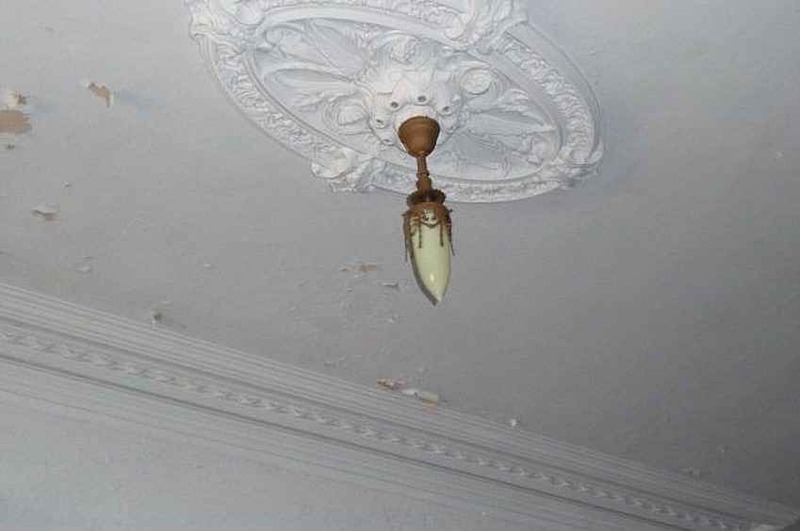 did anyone see the beautiful ceiling medallion hiding under the drop ceiling in the kitchen! What a shame this house must have been beautiful in its prime! I hope someone can save her! Next owner, INVITE ME OVER! Is it near enough to you that you would be comfortable for you to go see it and take lots of pictures? Of all people, you know what should be photographed the best. Ben from Georgia Trust is planning on getting more photos. If my weekend wasn’t packed, I may have asked to see it. Here’s a link to a video from 2016 which I found on YouTube. It’s definitely the same house, but for some reason is erroneously identified as being in Utica, Mississippi. The video also says it was built two years after the Civil War. 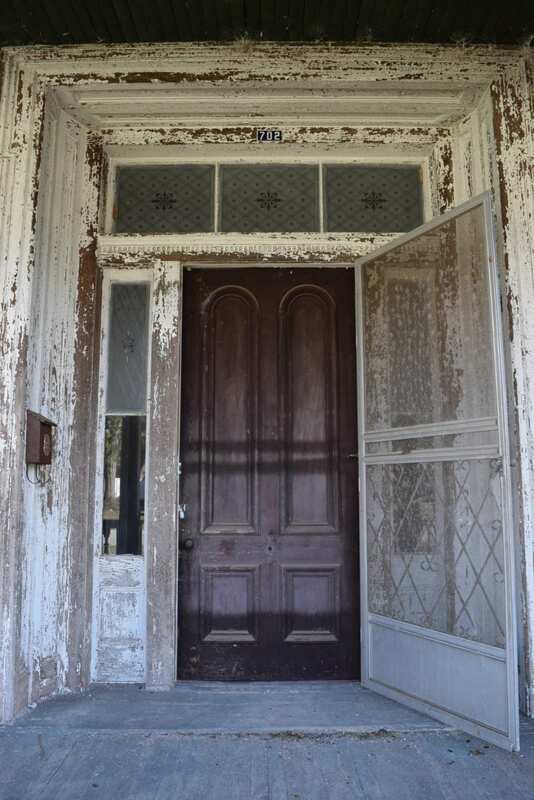 It raises the question of age… although this house is stated in the listing as having been built in 1876, the architecture clearly suggests an earlier construction date. The house combines Gothic, Italianate and even Greek Revival elements; I believe the house could indeed have been built in the 1860’s (if not earlier!). Here’s the link – enjoy the additional photos (and years of accumulation)! I think his claim 2 years after the Civil War and in Utica was just a mistake. Later he says it was built 1876. Doesn’t sound like the video/subtitle maker actually visited the home, he just took the photographs from the guy that did an made it into a video. Agreed that the video was sloppily produced. 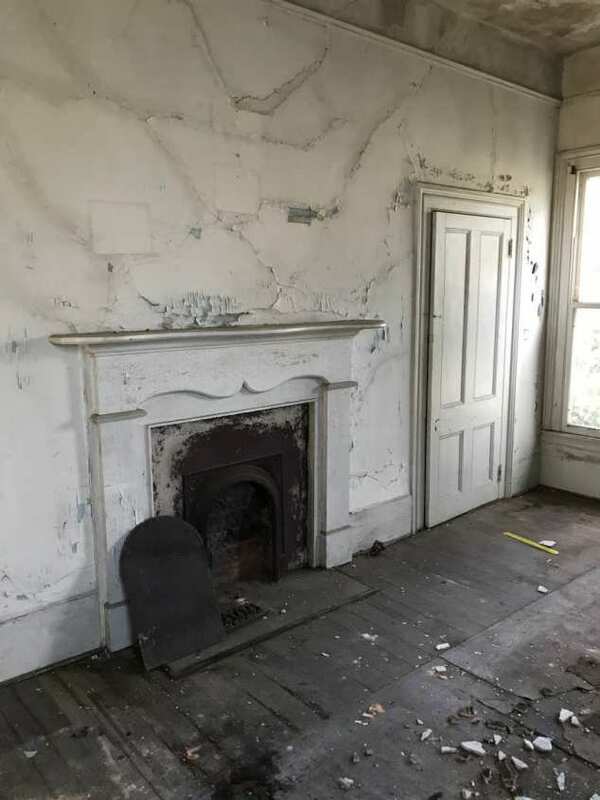 The 1876 date is no doubt accurate, though the use of some Greek Revival elements (door and window casings, most mantels) definitely gives it an older feel… not surprising in a rural location at that time. This fantastic house transcends “special”. Outstanding! Holy crap! Reeeeeally hope the guy takes a ton of photos stem to stern, up down and all over for you to share. Talk about “Southern Gothic”. Fingers crossed for pix, pix, pix! BE WARNED! It is TOO easy to get lost in this blog for hours. Brown has a particularly discerning eye for faded, ghostly fabulousness. 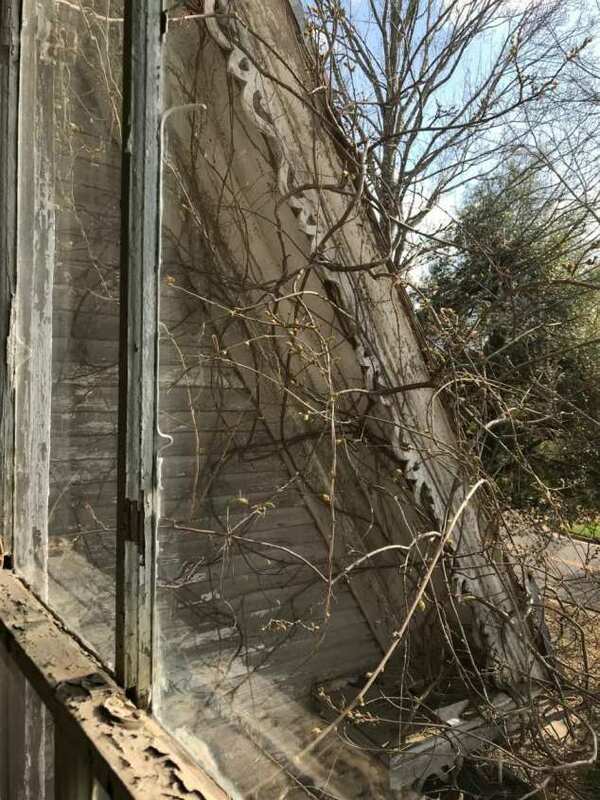 How much would you estimate restoration would be? That’s not something one can determine by just looking at the few pics available. You need someone or contractors after they’ve inspected the home. Also, I don’t allow quotes on OHD. This one speaks to me. 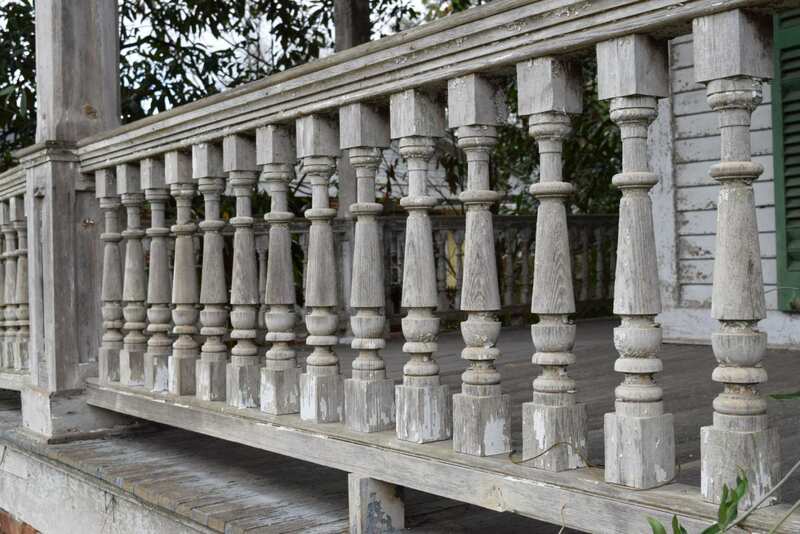 Beautiful staircase and lovely porch. I hope it finds a loving owner to restore it. It is a true beauty. I only needed a slight glimpse of that exterior and I knew the collective Old House Dreamer’s eyes were going to pop out. Look at that exterior. It’s a masterpiece. I’m with you Kelly. This one literally has my heart pounding! And Georgia is on my list of places I’d move. Do you know anything about Louisville? I drove around and it looks like a nice well kept little town. Don’t think I’ve ever been to Louisville so couldn’t say what it’s like. Louisville is wonderful. Lots of history, lovely people. It was the 1st permanent capitol of Georgia and has amazing architecture. The Ogeechee River flows through town if you like canoeing. There’s a small private airport, and it’s all about one hour from Augusta and only about 3 hours from Savannah. I was raised there and spent 25+ years calling it home. Someone buy this house! It also has a rare feature … a root cellar! I knew a sweet lady who was raised in the house and she told me all about it. It’s a house full of love and hope, and just needs a chance to return to glory. I grew up in Louisville. When I was young we never had to worry about locking our doors or people bothering. There were a few unsettling things but nothing extremely bad. My dad worked for a placed called Thermo King, now closed. There was another factory outside of town called Fortsman, I think. It opened after a cloth manufacturer closed its doors. Please don’t quote me on that. I may have locations confused. Mind you, I haven’t lived there in 40 years. My parents are buried there. We should all pitch in $100 whether we can afford it or not. We could get up a large enough fund to buy it and get the roof fixed. Then we give it to Kelly, who May not be able to move there, but will be sure that it is properly taken care of. I’m in, I just don’t have any extra money to spend on it! I was about to ask who was starting the Go Fund Me, PayPall, or whatever. I was seriously all in. that is the least we could do for all the hard work you put into our little niche community. 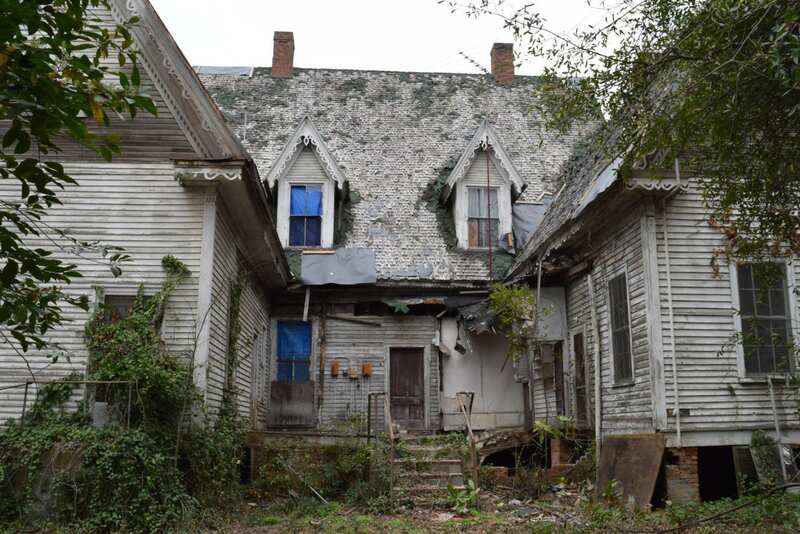 Someone needs to save this precious house. There is nothing to not love about it. It’s 7 hours from me and more work than I have the know-how to complete, but she needs some love and a good owner. If it can’t be me (or Kelly,) it needs to be somebody. 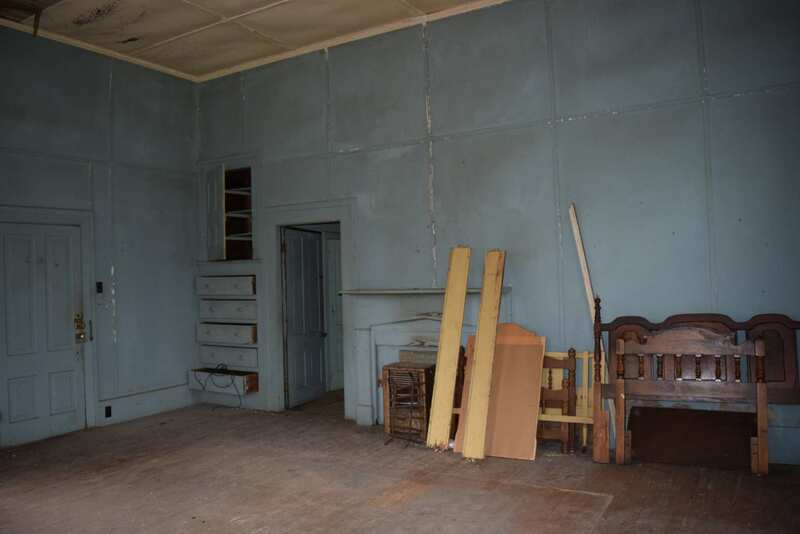 Kudos to the real estate agent for making a very old home supportive listing, by the way. I’m tempted to start a go fund me page, actually. Rehab it and maybe donate it back to the city as an event center? Anyone have suggestions to help me organize that? How does that work legally? Just shop around for options for starters. Make sure to check the “pass through” rates per dollar, as you would hopefully do before contributing to any charity. Pass through rate for gofund is about 92% after basic fees, plus a $.30 request fee per payment request. Kelly has asked that no links to that site be posted, in addition to her opinion of why she thinks this is a bad approach. I agree with her completely, so please scroll up/down if you havnt seen her comments yet. 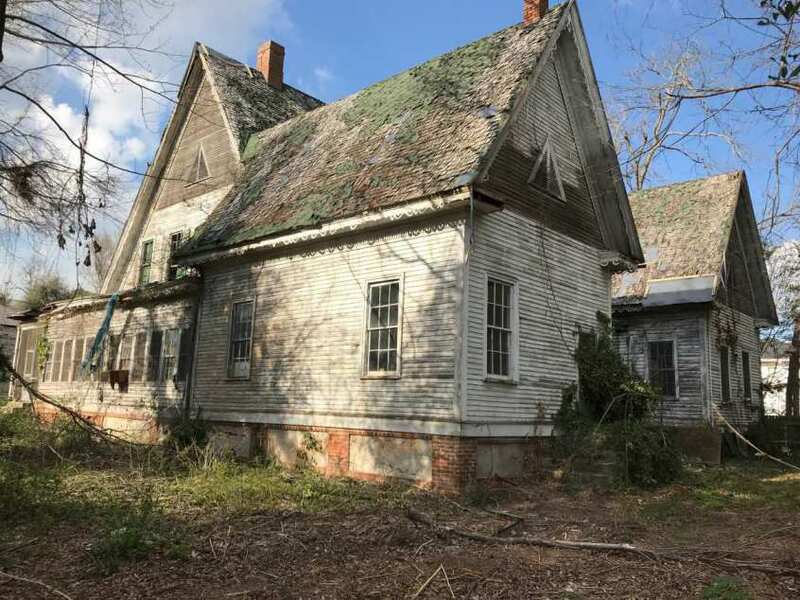 Some very bargain priced old homes offer little potential even after being restored; however, this one would absolutely be a gem, post-restoration. 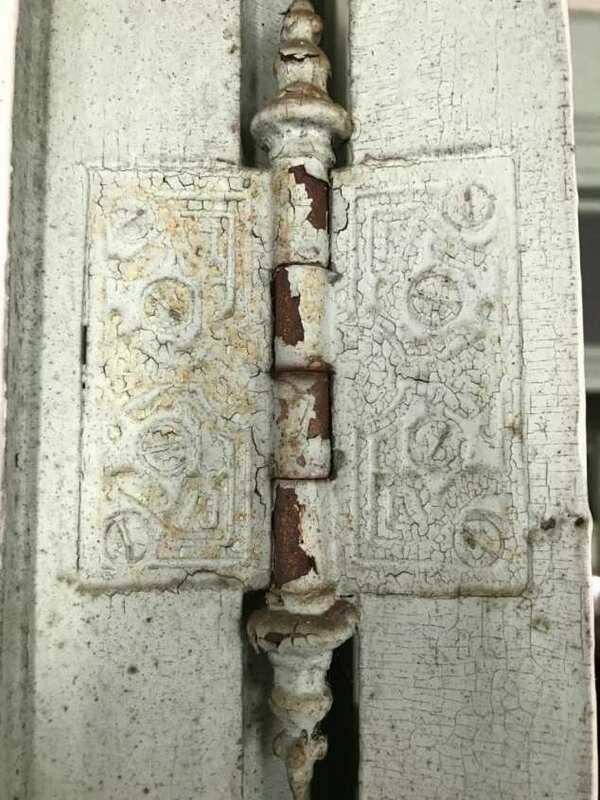 Did anyone notice the last photo showing the rusty shutter hinge still in place? 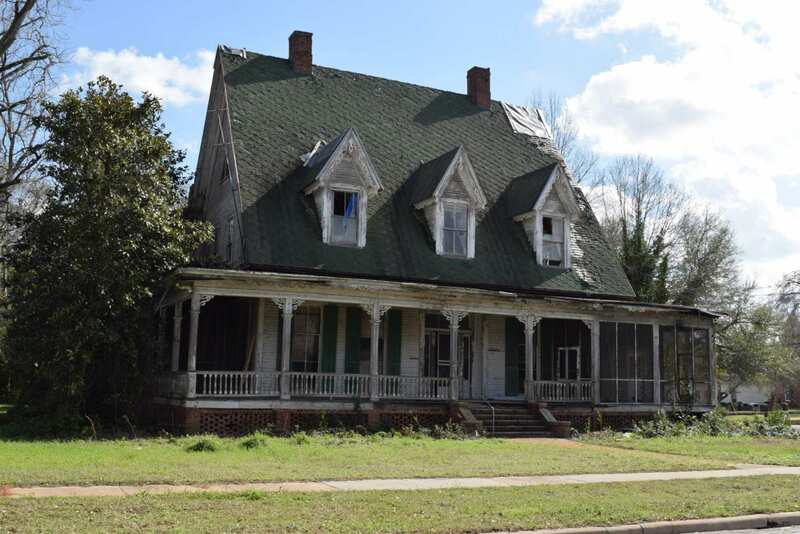 Someone will need to spend money to restore this rare home built at the end of the Reconstruction era in the South but I think it would be well worth the effort. 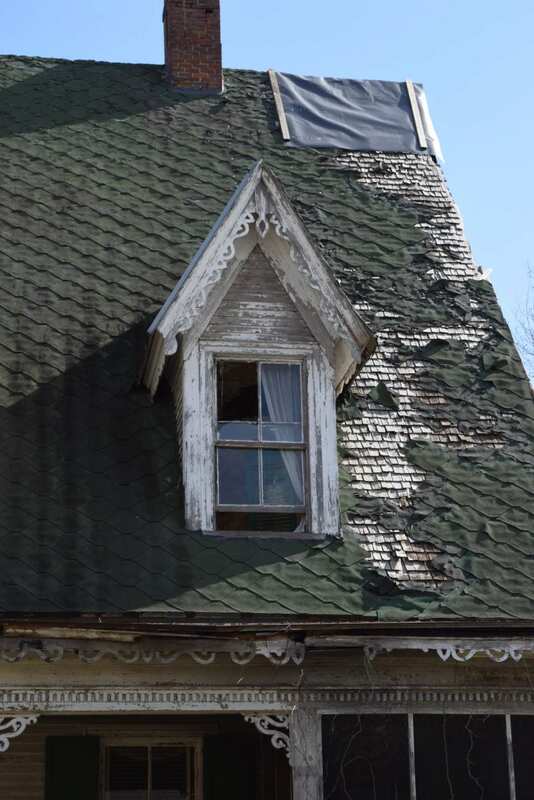 The rescue needs to happen very soon as the exterior photos indicate a roof nearing the end of its usefulness. 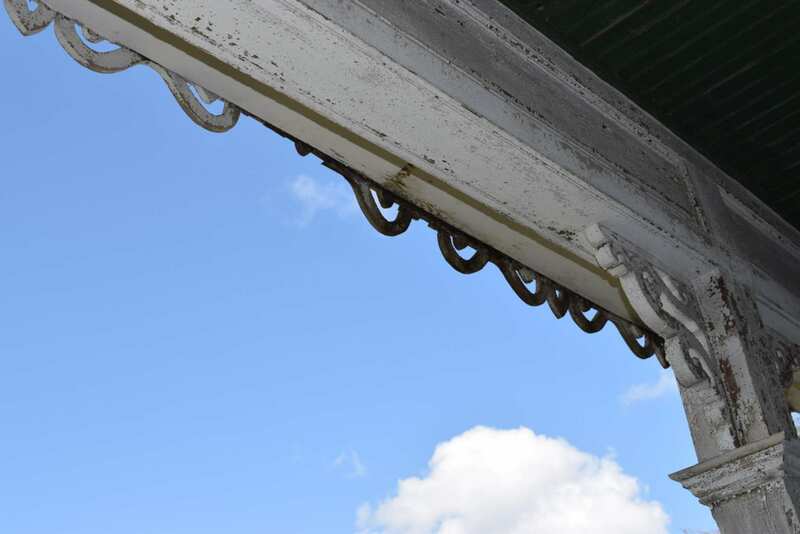 Once leaks begin to deliver water into the home’s interior, it can cause massive damage in a relatively short period of time. 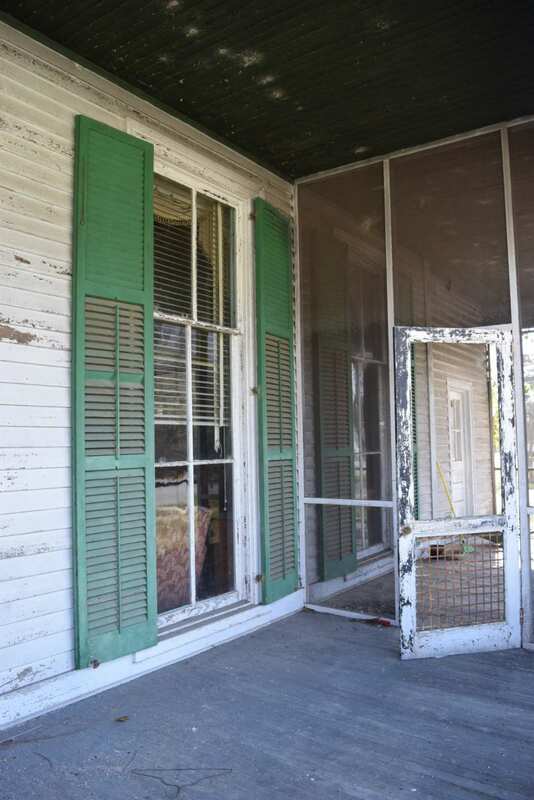 Who will be the next Preservation hero for saving this faded Southern Belle? Sidenote: Kelly, as much as I know you love the family home you’re living in presently, this place would take your love and appreciation for old houses to a whole new level. You could continue to live or rent out your present home while making this you and your husband’s “forever” home. In any case, here’s wishing good luck to the next owners. 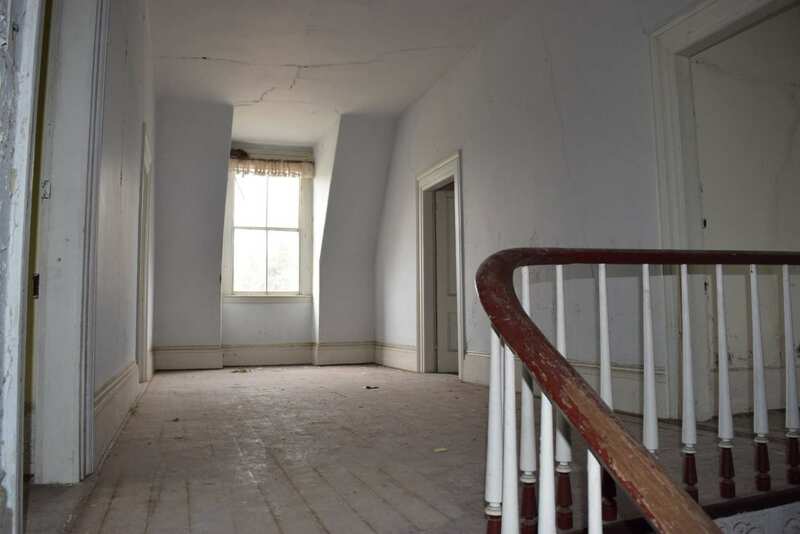 I can envision this house restored to its 1870’s glory. No one would ever imagine that it was once in this endangered condition. 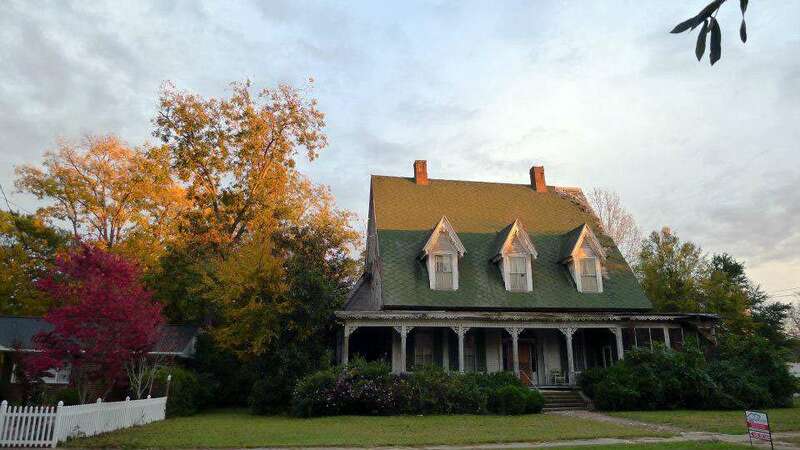 Gothic Revival style houses were always rare in the South which heartily embraced the Greek Revival style temple form houses but here and there an occasional Gothic Revival house pops up. 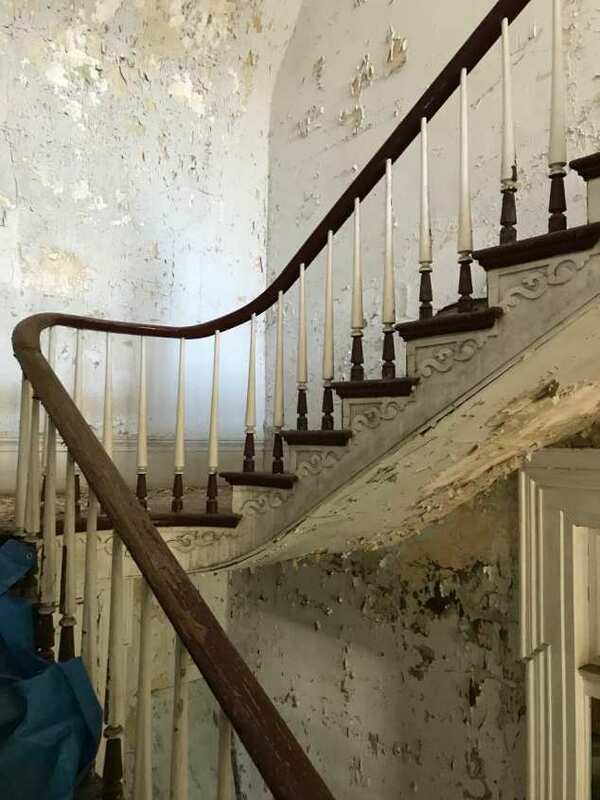 Even rarer is to find one built during the post Civil War era. 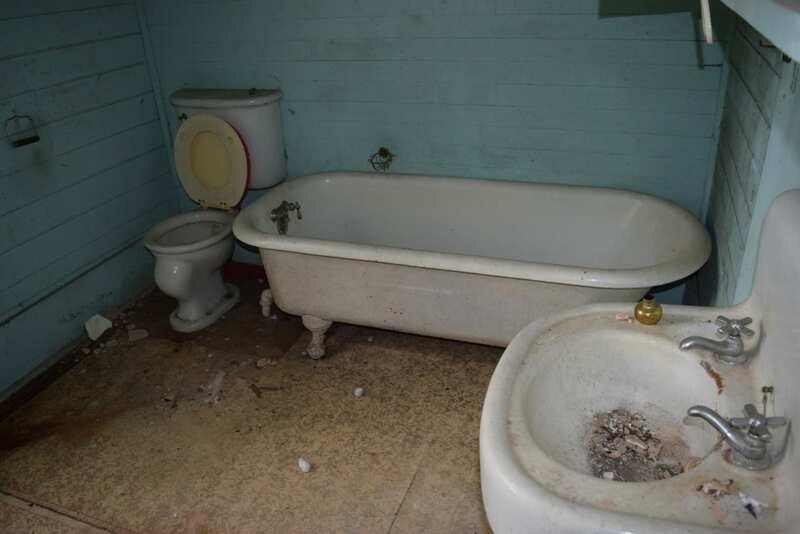 John, what do you think this would cost to restore? Of course the skies the limit but to restore it enough to live in it and then work on it slowly thereafter. Sorry, I do not allow quotes for repair/restoration. This house is screaming my name. I love everything about it and it would make a PERFECT bed and breakfast with a little (a lot) of work. It is beautiful and has great bones. Too bad I don’t have the money with which to purchase and update it. Like you Kelly, I have been in love with this house for many years and I would move today if I could afford the restoration! So many wonderful details still intact. Such a rare survivor. And so very threatened by that failed roof. 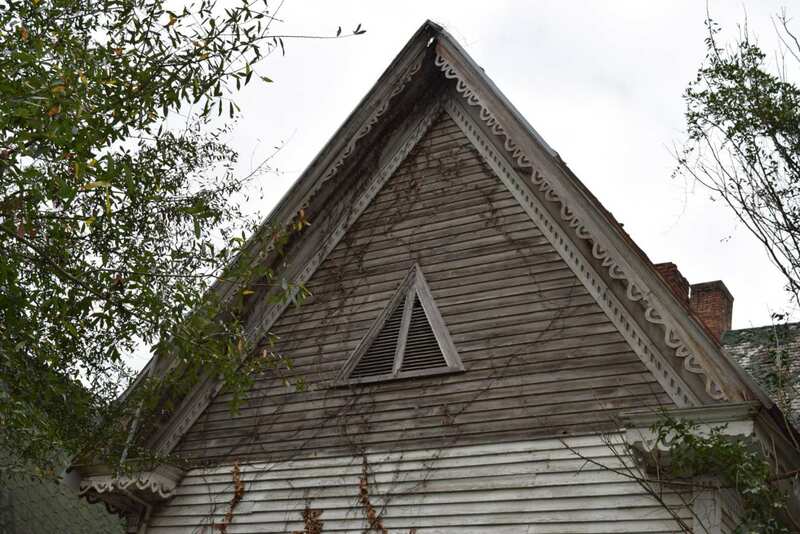 I’m looking forward to more pictures – especially the gable porch. Somebody needs to slap a tarp on that roof pronto, poste haste, asap, etc! There’s so much in this house worth saving. I’m in love with it too — how about if we all bought it & moved in together to fix it up? Seeing it restored would be a huge joy. Tragedy that something built with so much care & imagination should be unloved for so long. I am too old to help with the restoration much but I will do the cooking! It’s not often that a Gothic Revival style house on a scale as grand as this one is proportioned so well. It’s capital P picturesque. 15’ ceilings?! That’s like, CRAZY UNHEARD OF tall! I would KILL for the chance to get my hands on this. 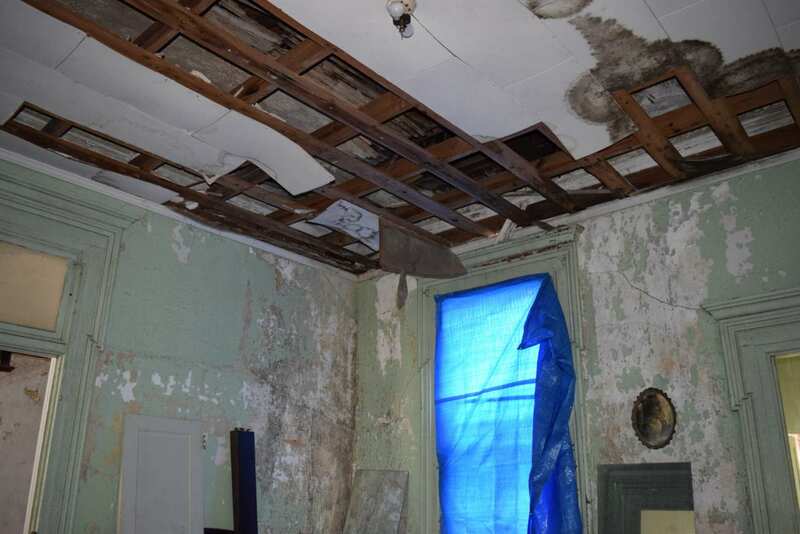 I’m really digging that whoever dropped the ceilings left all the ornamental plaster alone. Yummy! Lots to love in this one. Like the listing states (multiple times, lol), this one will require a significant investment, but with such a low initial price tag, I still think that someone will be able to bring this beauty back from the brink and not be completely upside down. 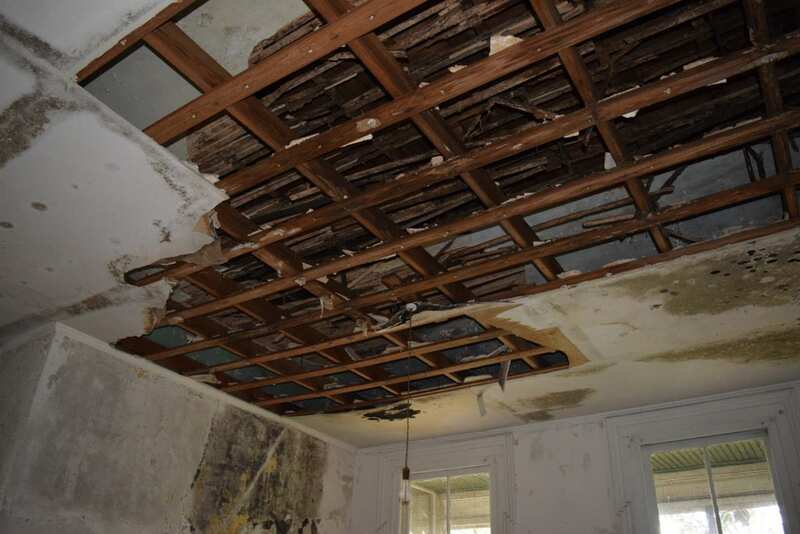 if they dropped the ceilings they were probably too lazy to destroy the old detailing. 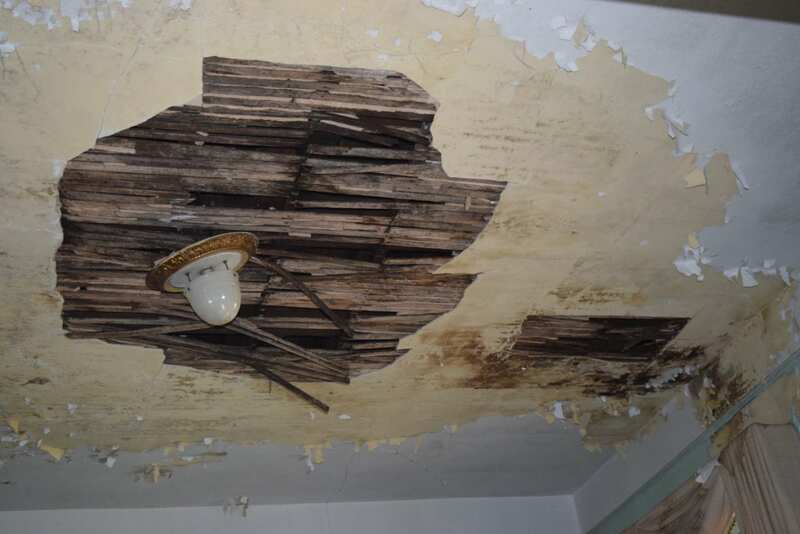 the roof has leaked for years. it will take months of low level heating to get the humidity reduced. first jobs are always foundation and roof. 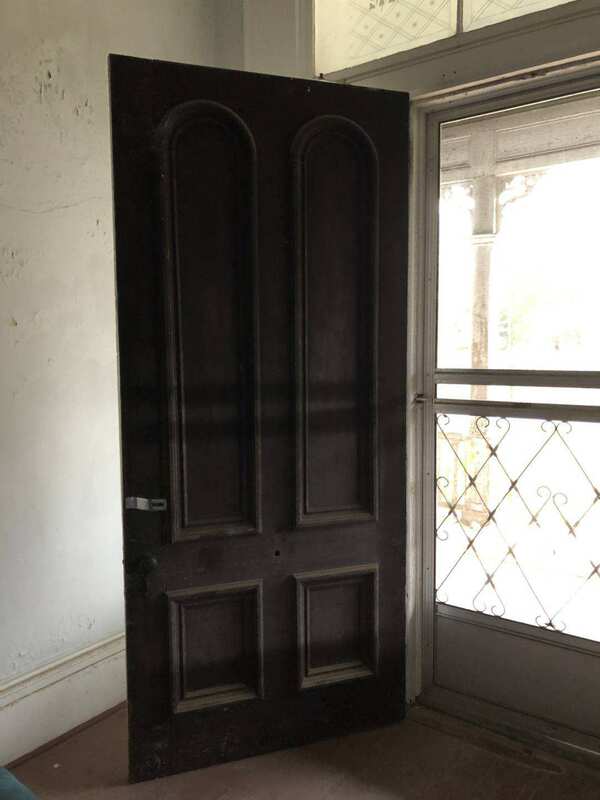 leave any paint grain of doors and trim alone, it may get the extra coats of varnish scrapped off the top of the paint in a couple of years. repair all plumbing but leave it alone until a real plan solidifies. remove ill advised modernizations. scrape all the peeling paint off the plaster. 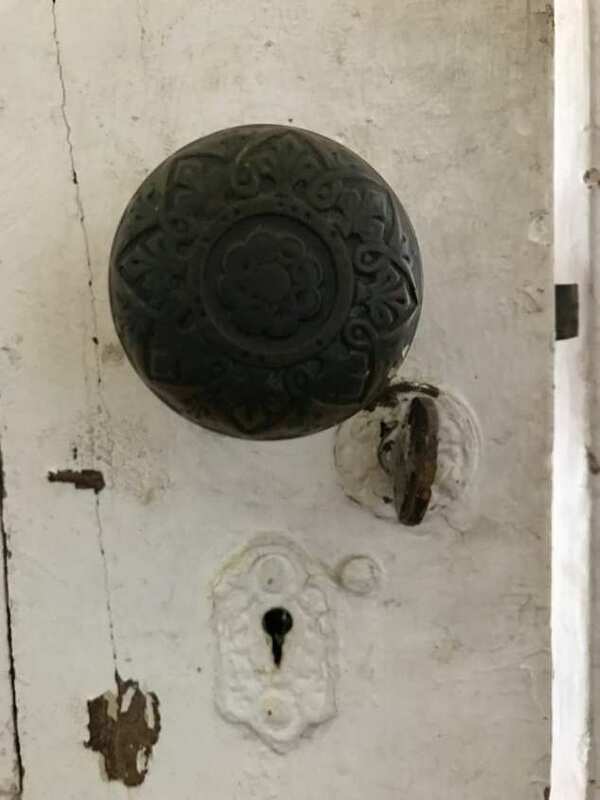 keep your eyes open in the local second hand shops somebody got the doorbell off the front door. 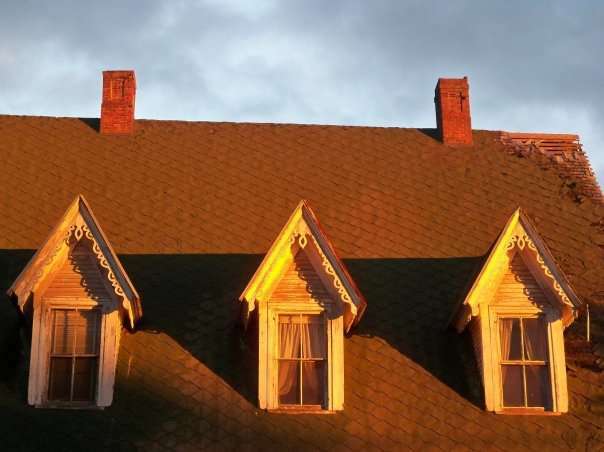 Thank you Georgia Trust for patching the roof!!! 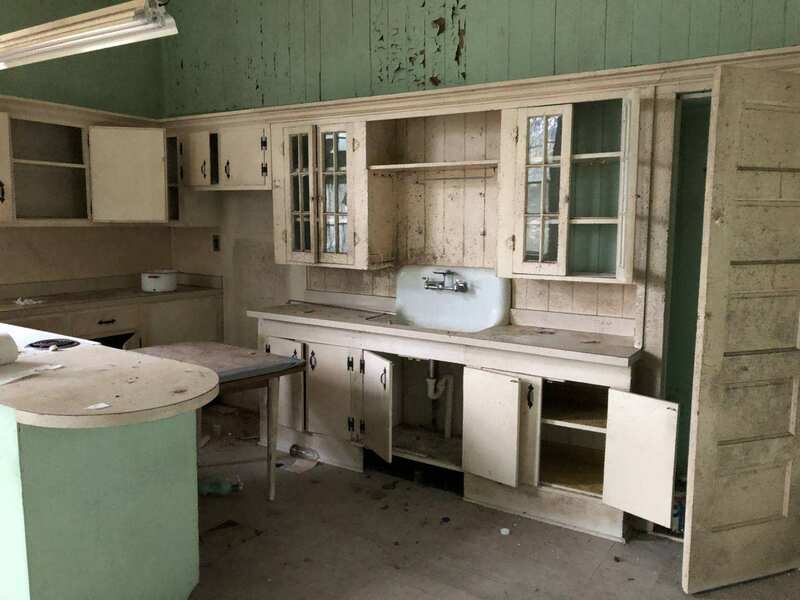 Had I not just bought, this house would be massively tempting in spite of my lack of reno experience. More likely because of it, actually. Love the shutters, windows, stair way, plaster, that kitchen sink! 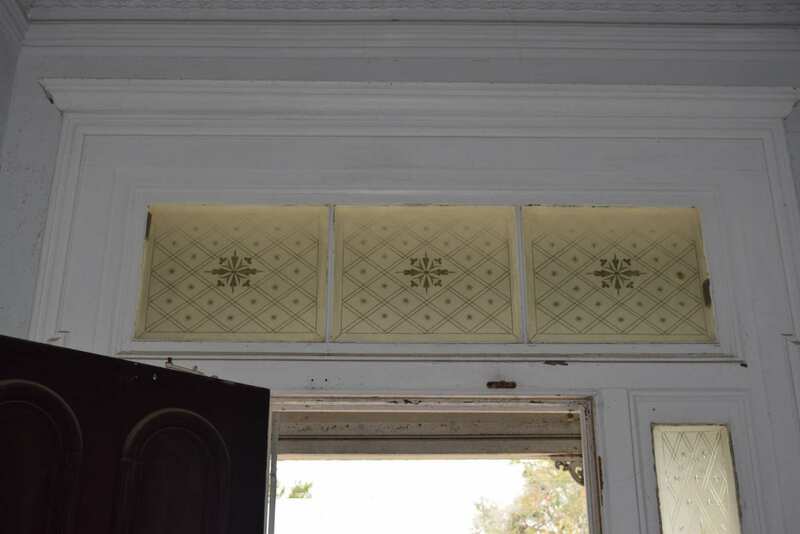 I want to see the ceiling medallion minus the grid!! This is just GLORIOUS. I’m giddy. Swooooon…. Even if none of us buy it, there are probably ways we could contribute (individually or collectively) to it’s immediate survival and subsequent restoration. What a gem this home is, my oh my. I knew I remembered this one from when it was listed in 2011/12. I remember the listing stated that the house was owned by the agent’s mother. It began at $69,900 and by 2012 was last listed at $39,900. Am always surprised when rather than lowering the price drastically (as has now been done) to find a buyer, sellers would rather hold as the asset deteriorates. Pics are still online on an old z###0 listing from then. Sometimes, the price actually increases or at least doesn’t go down enough because the owner has had to pay property tax for that year+ that the house didn’t sell. By the time a sale finally went thru, I owed $6000 on a house that ended up taking 15 months to sell…. This house is a rare & special treasure. ugh. I just passed out. This one breaks my heart! 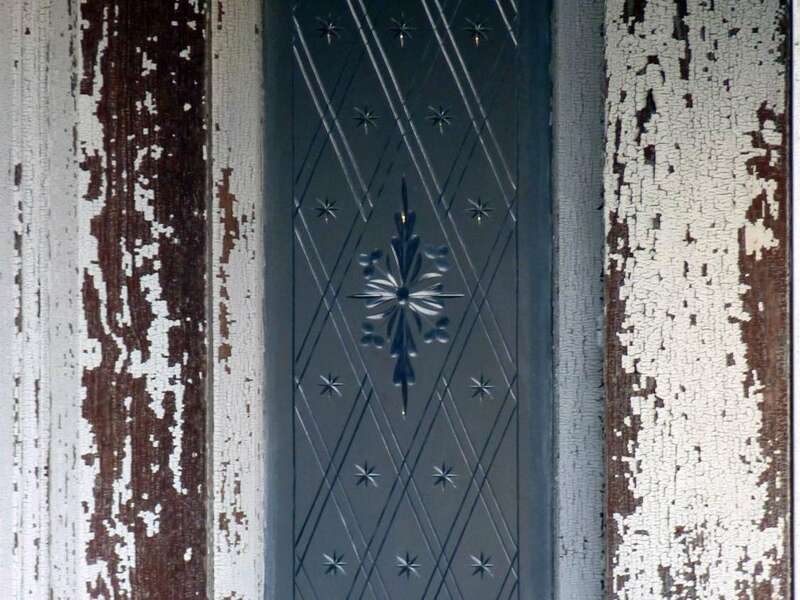 I hope to see it restored and brought back! Maybe the new owners would blog their progress or have a Facebook page! Such an absolute dream house. I am a Realtor and I live here in Louisville. I am more than happy to go over and take as many photos as you would like! I love this house and it would be an honor to be able to see the inside! Brandy, I have the cash but live in Montana (and we just got close to 4 ft of snow and can’t even get down our driveway yet!) so can’t just up and go see the property right away … will you be my eyes/agent and go take a detailed look. This would have to be contracted/closed through the mail (title company), and see what requirements the trust has please. Let’s see if we can find a time to meet up, I’ll be in Louisville soon! Please let me know when you will be in town. I would love to meet up with you! Contact info is up top under the description, Ben Sutton. Oh my gosh, please keep us all updated! The dreamer that buys this beauty should do crowd funding. I would donate to save this beauty. Feel free to shoot me an email through the linked webpage. Thanks! It’s still showing for sale on the GA Trust site. I am a Realtor and would love to help! Oh my, oh my, oh my! What can I say. Why can I not have tons of money and years and years of life left? Too many houses, too little time. I guess that’s why I concentrate on my miniature dollhouses of which I have at least 22 not counting kits to put together. Currently decorating the 4 story French Quarter with the last being my Georgian. At least if I can’t have the life size I can enjoy dreaming in my mini ones! One of my fav books in the 70’s. My Mom read it to me all the time. My inner child would love to live on Mulberry St. What a fabulous house! I bet there is a lovely romantic story about the building of this house. Hope we hear it some time! Best of luck to lucky new owners! Every detail of this house speaks to extraordinary craftsmanship. What a beauty. Ok Kelly, this house needs you, and you want it, so just announce you’re doing it and then set up a go-fund-me account and we will all donate. Or do a kickstarter. Set a goal that is attainable with a kickstarter and do it. Do tours of your progress and we will all pay to visit — gladly. Look at what Ross has done with the Cross House. As for the house, it is divine. The kitchen is amazing. The stairs are elegant. This house is so beautiful because it is so simple. Even if still partially in ruin, if the roof isn’t leaking you’re just, then, surrounded by antique beauty. We’d all be rooting for you. Make it your life’s work. Just sayin. 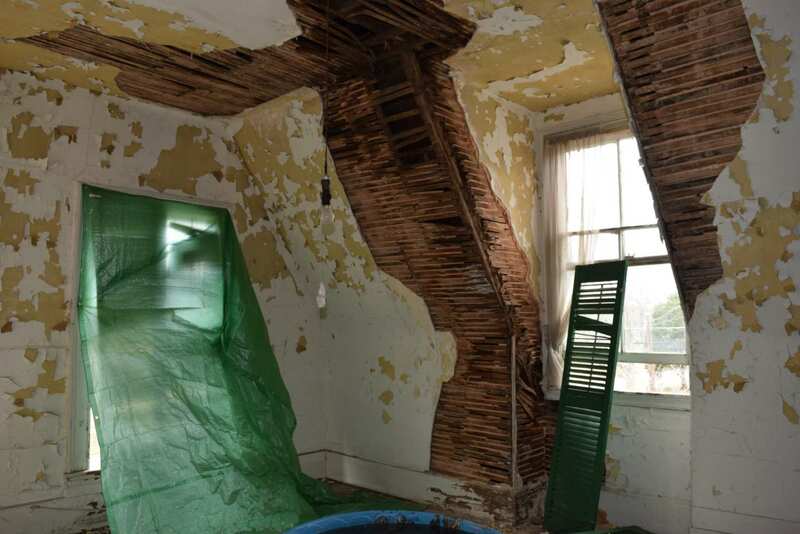 GoFund me is not a good idea for buying and restoring a home. I hope no one really tries it with this one. 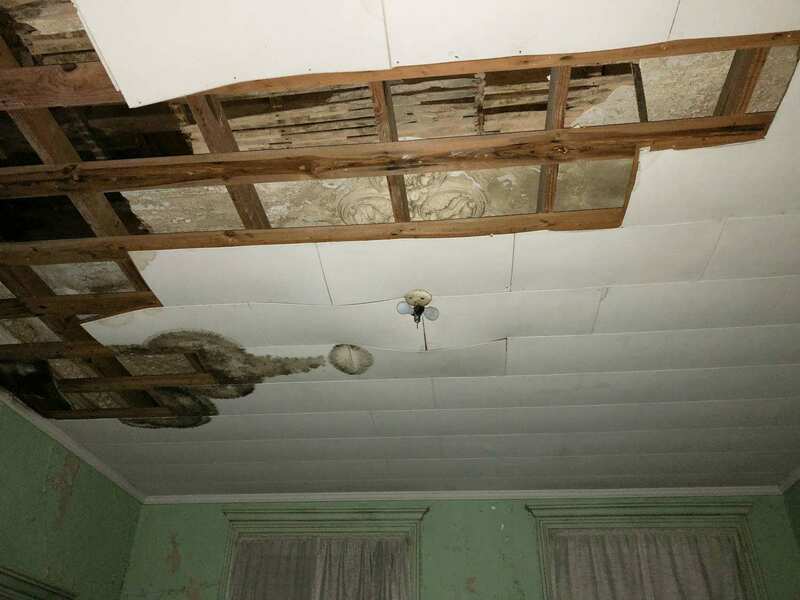 The problem this house and many other old houses face is cost! 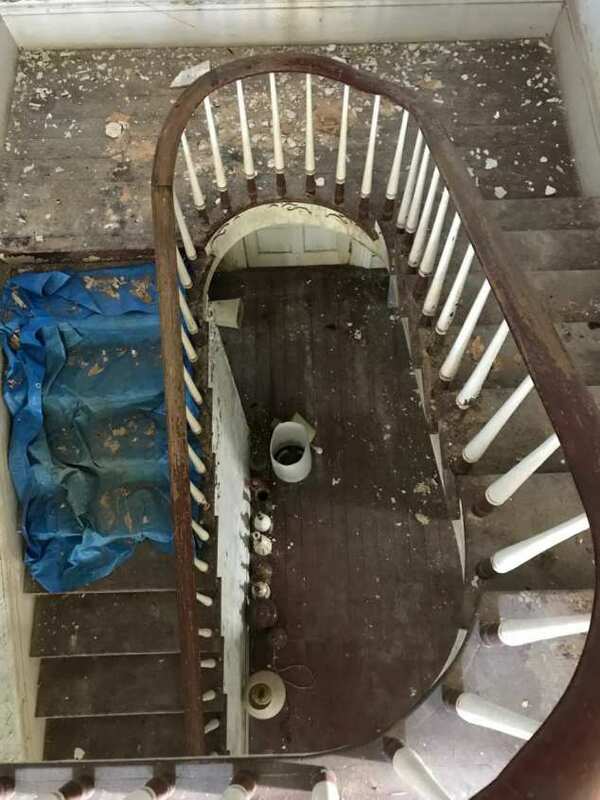 When you look at the local real estate market it paints a grave picture for this house, the costs to restore will likely run into the 6 figures and most people wouldn’t justify spending more that they could sell it for once restored and this is the biggest problem I see with a lot of amazing house’s on here. Honestly I think what someone will do is offer them 1 dollar and in contract will have to agree to restore it. Too bad they took the old refrigerator out! Wonder if they left the stove??? I’d love to get a hold of it! 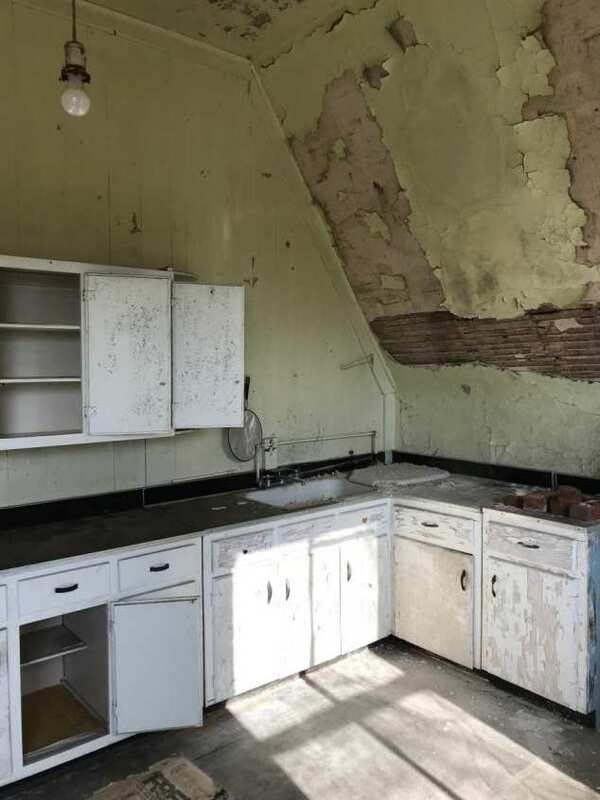 That kitchen has great bones to be a show stopper! For brevity’s sake I echo all of the above awesome comments. 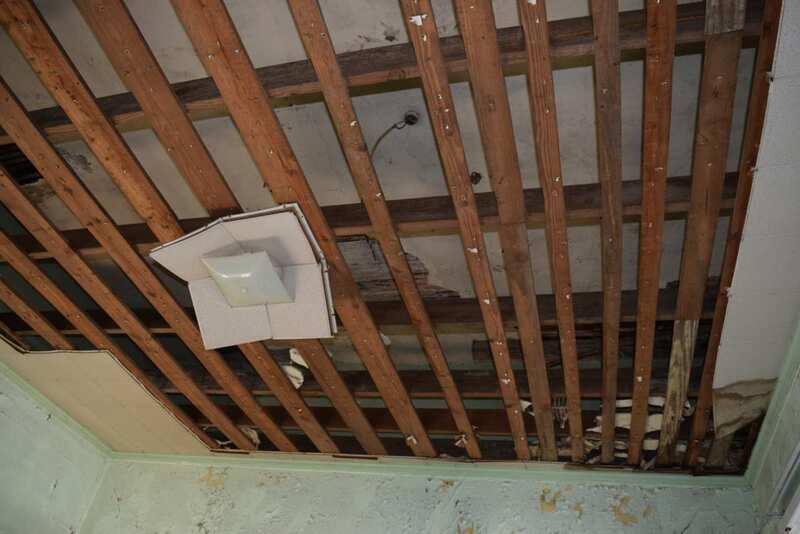 I do wonder, however, if there is a mystery art decorative plaster piece peeking out from the picture showing the falling ceiling lath and plaster eighth picture down? I’d work to restore it! 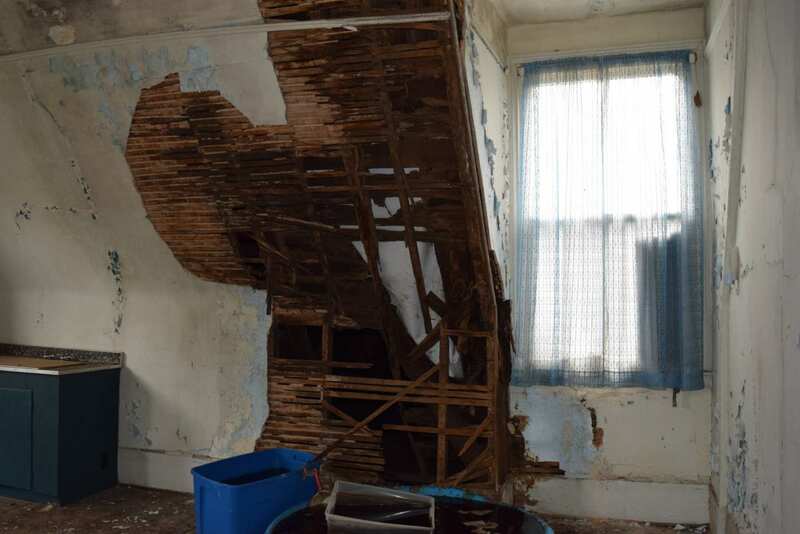 I’d LOVE to get my hands on this gem, repair the roof ASAP, fix that broken gutter and complete some interim damage control on the outside exterior as I slowly begin a nice restoration process on the inside room by room. So tempting….This house is yelling for someone to save her! Hi Glenn. I just found this whole discussion. The original owner was James Cain Little, my 2nd-great grandfather. 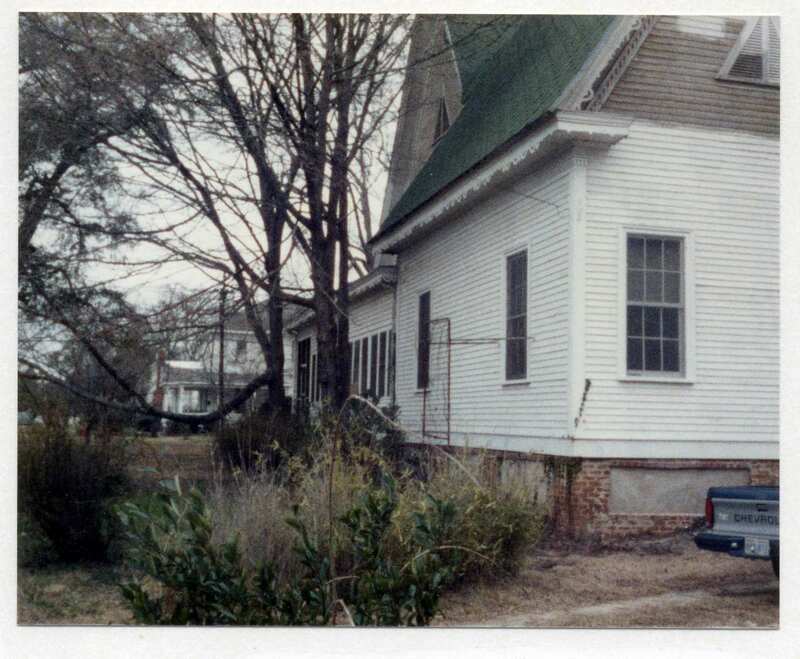 I have a picture of the house from around 1900 that shows the full right side of the house. 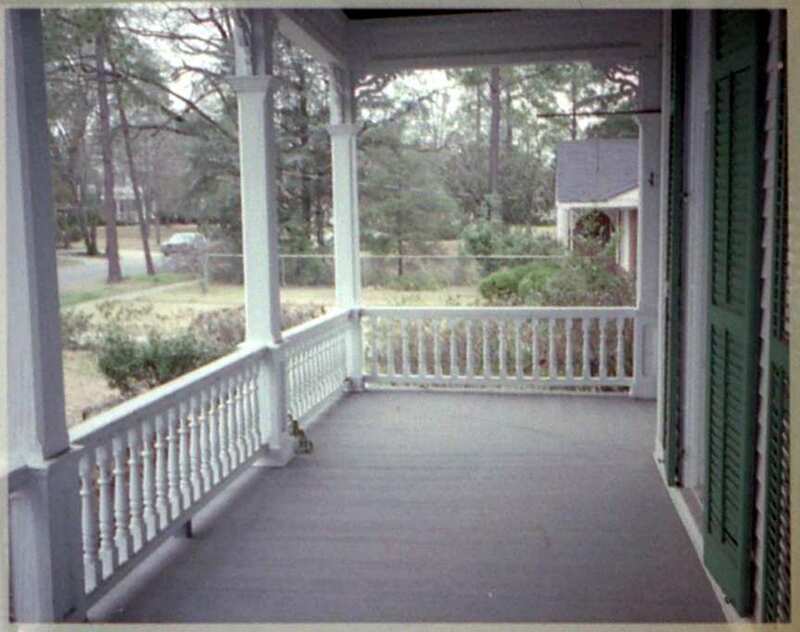 The porch did wrap mostly around the front. The house faces northwest. I’ll look around, or ask Kelly, if there is some way to post photos. Yes! Feel free to send them my way, kelly@oldhousedreams.com I’ll post. Like others here, I could easily afford the sale price, but to properly restore this gem is going to take a substantial pile of disposable cash. Unlike Kelly being 3 hours away, I’m 3 states away. I will anxiously wait for pics, & wish the lucky new owners well. 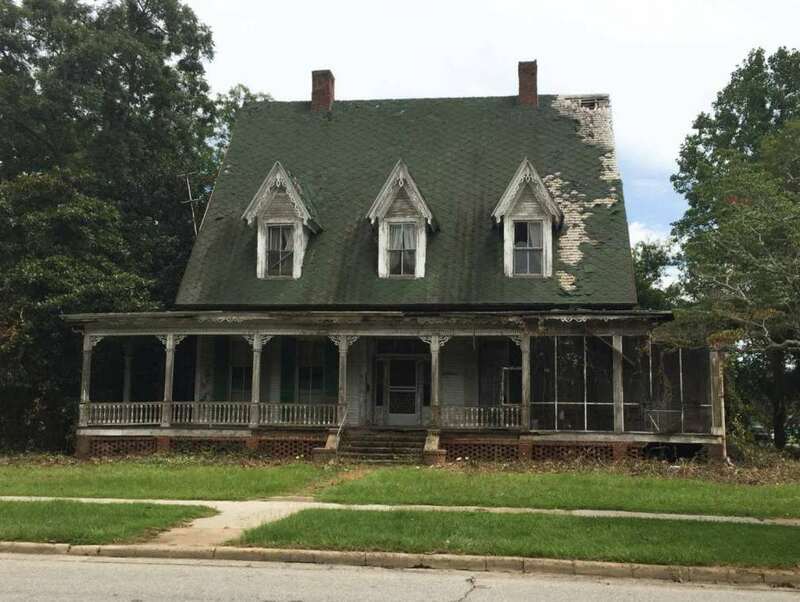 I live in Atlanta and I’m looking for a property out in the country and love historic properties. 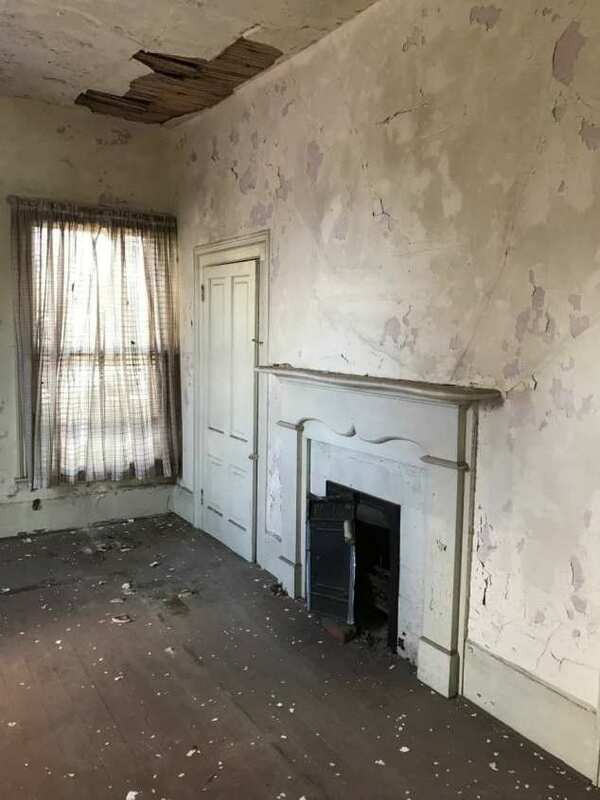 I am limited in what I can afford, but $15,000 for the house is awesome and if I could find out how much it would take to restore and if there’s anyone out there who could guide me on who to contact I would love to find out what the cost would be and if people are truly interested in helping with a go fund me page to pay for the restoration, I promise to take good care of the house and honor it the way it should be. I am 53 years young and just wanting to buy my first and forever home and this would be such a beautiful one to have. If anyone is interested in helping I’m happy to give you contact information but let me know of any input y’all have on this. Please no linking to GoFund me pages. 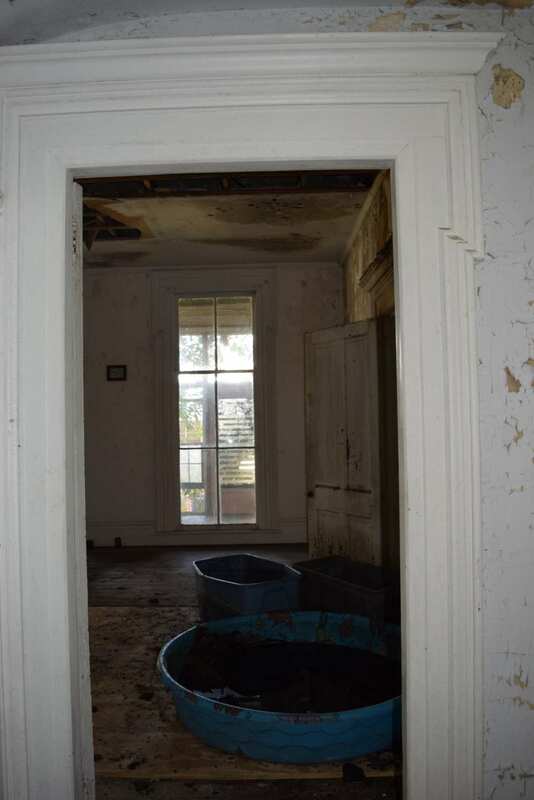 I know hearts are in the right place but it’s a bad idea thinking you can buy this home and money will magically appear for the restoration cost. Ask those that set up funding pages for their restoration how it went. 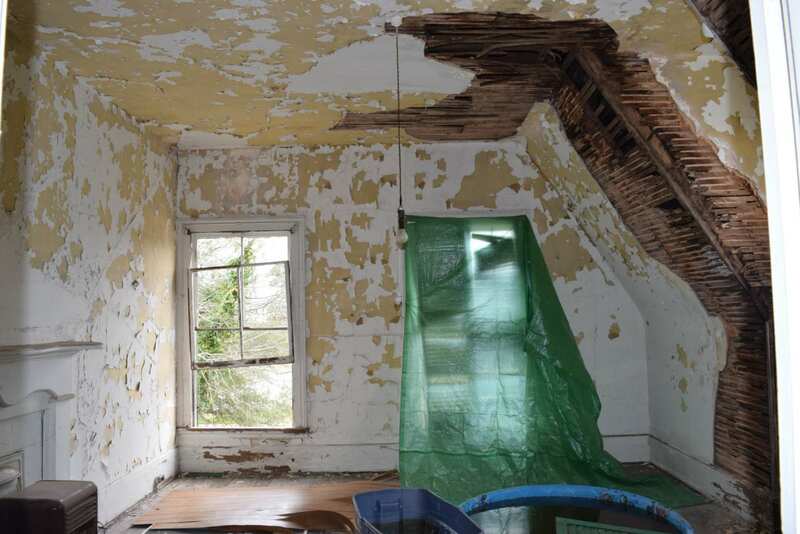 $15k is a small amount for a home but don’t think this is a weekend project house, it’s going to require a lot of time and money and if you don’t have immediate access to the cash to restore it, waiting for GoFund to pay for the restoration will only prolong the deterioration. I want to live in this house so much it hurts. Once in a while, you see a home that just grabs you by the gut and feels like you know it, you have lived in it and all is familiar. My husband has all the knowledge and skill to do this but oh how age does mess with our dreams! Still, I will show him this, whine and beg that we move the dogs and cats, house and barn full of projects and plans from Missouri to Georgia. Count me in on those that would love to see someone buy and save this wonderful home. …and that kitchen is my dream. I am smitten. 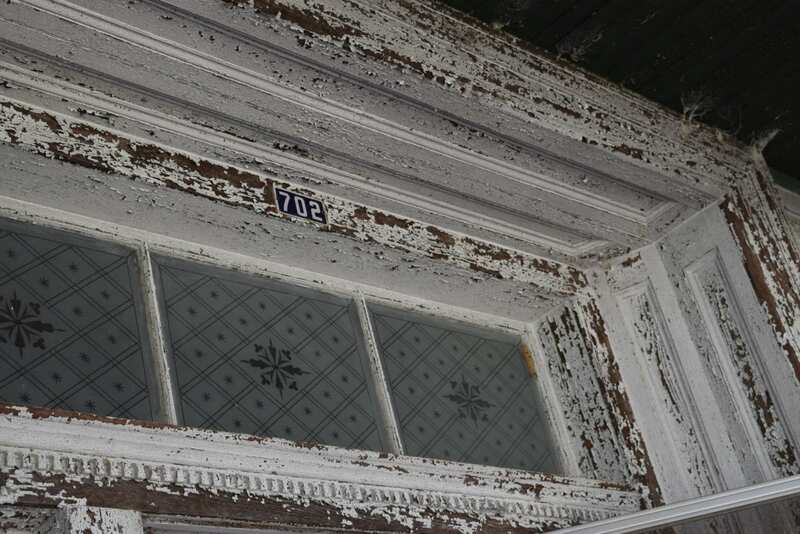 Is there anyway to talk to the people at Rehab Addict to see if Nicole Curtis would take on the project? Nicole Curtis would destroy this house. She only works in the Detroit area anyway. The Georgia Trust page for this house (linked at the top) has a donate button. It goes to the whole of the Georgia Trust, not directly to this home. I’m not even sure the GA Trust owns it, sounds like the “Louisville Downtown Development Authority” does. You’re right that we don’t own it, but the Georgia Trust does have exclusive rights to market and sell the property. I love the enthusiasm for this house – it immediately caught my attention when I drove by it. If people are interested in donating through our page, it can be earmarked for our Revolving Fund. 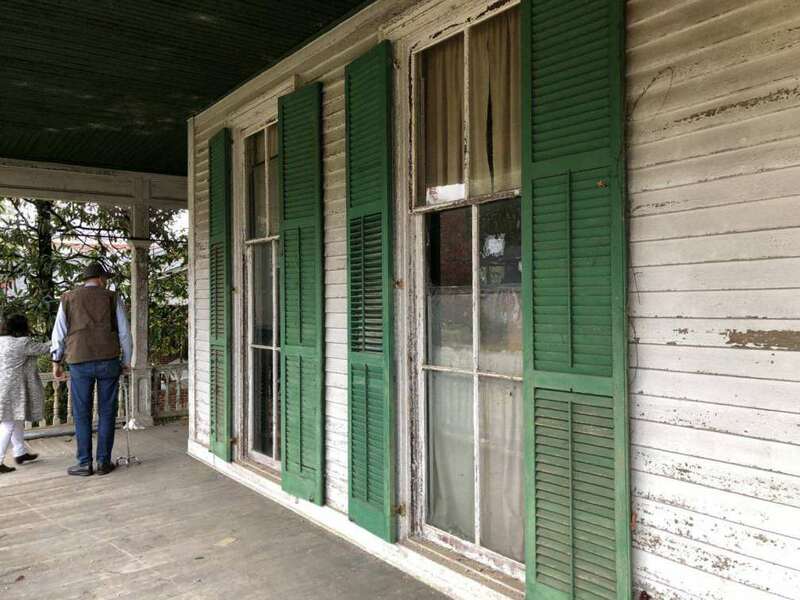 So, while it might not go directly to saving this house, it will go into our real estate efforts around the state. Thanks again for helping us out with our mission! I sent you an email to the email address provided. 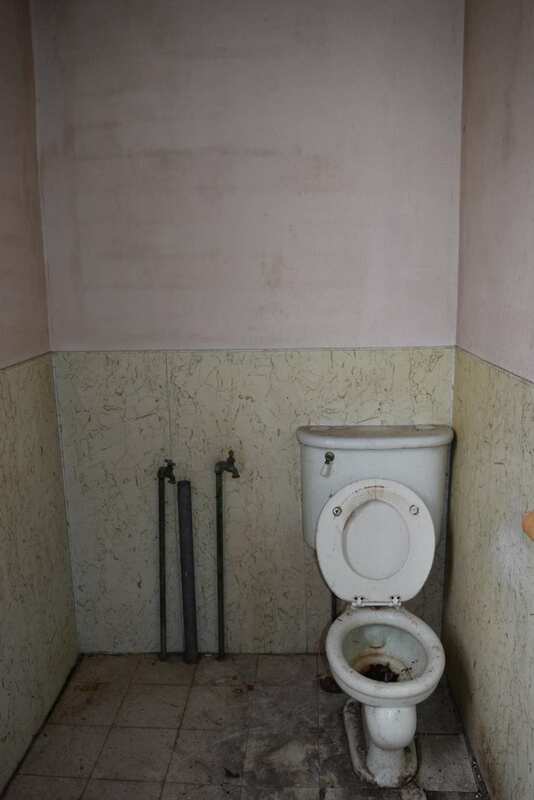 I am VERY VERY Interested in this property. Could you please contact me at the email/phone number provided so we can discuss this property. I’ve forwarded your email to him. Over the years, a small number of shared homes seem to have possessed this magnetic attraction quality which eventually leads to a happy ending. 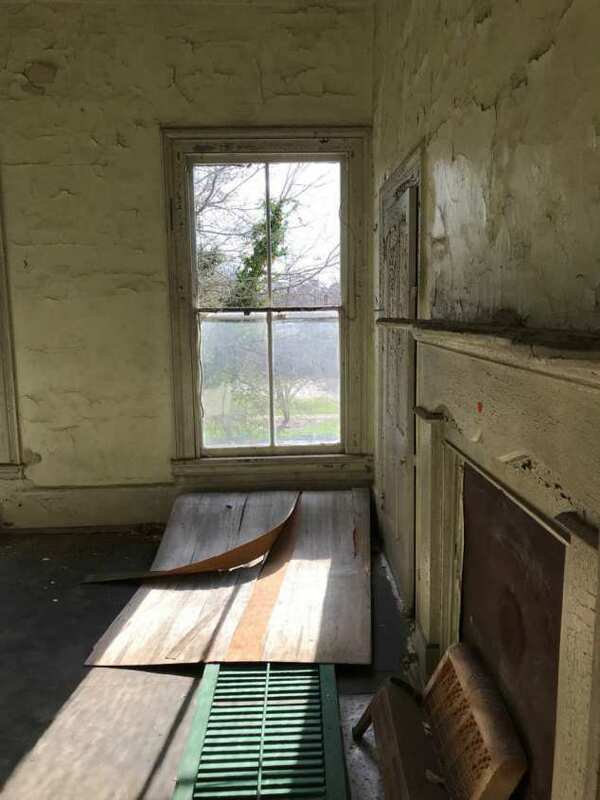 I have a very good feeling about this house and envision the day when it will be fully restored to its original appearance and charm. 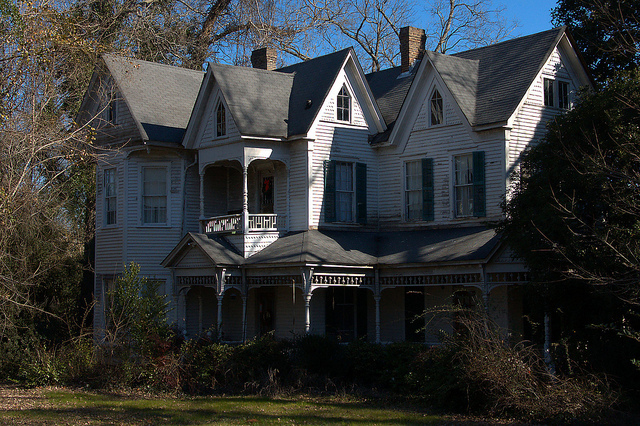 This Gothic Revival home is also fortunate in being in a location steeped in Georgia history. 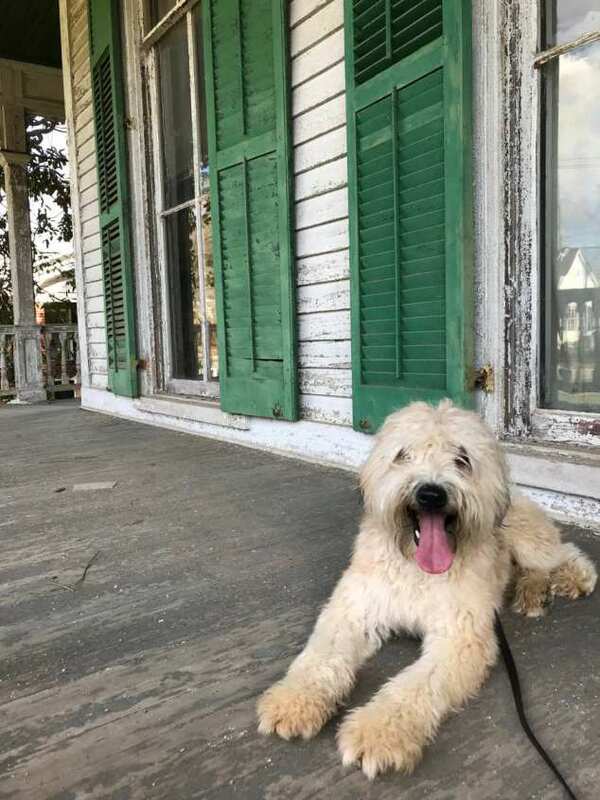 I hope that fate or divine guidance leads the perfect next owners to find this faded jewel so they can provide her with the tender loving care she deserves. I look forward to the day when I can visit Louisville and see this home in its original glory. 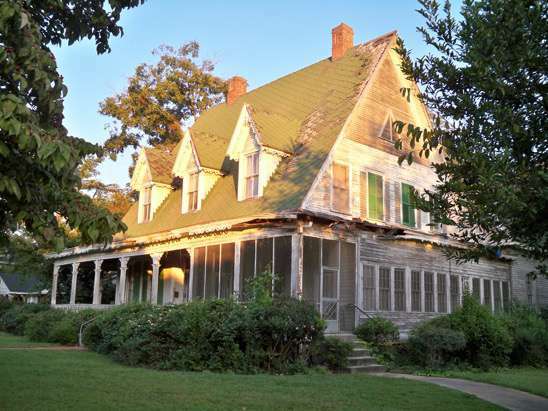 Local historians generally agree that it was built in the immediate post Civil-War years. Times were unbelievably hard across the South during those difficult Reconstruction years so surely witnessing the building of this fine home brought with it the hope to many that better times lay ahead. Today, this very old home itself awaits better times. Judging by the enthusiastic, even passionate, responses here, I don’t believe that wait will be much longer. John, your first paragraph put what I’ve been feeling into words. Thank you, sir. Zann, thanks for your kind words. 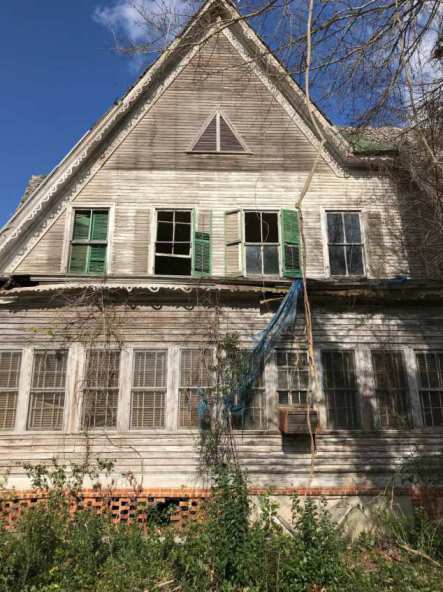 For many years, I’ve been passionate about old houses and have dedicated much of my adult life in pursuit of saving and preserving our architectural heritage. 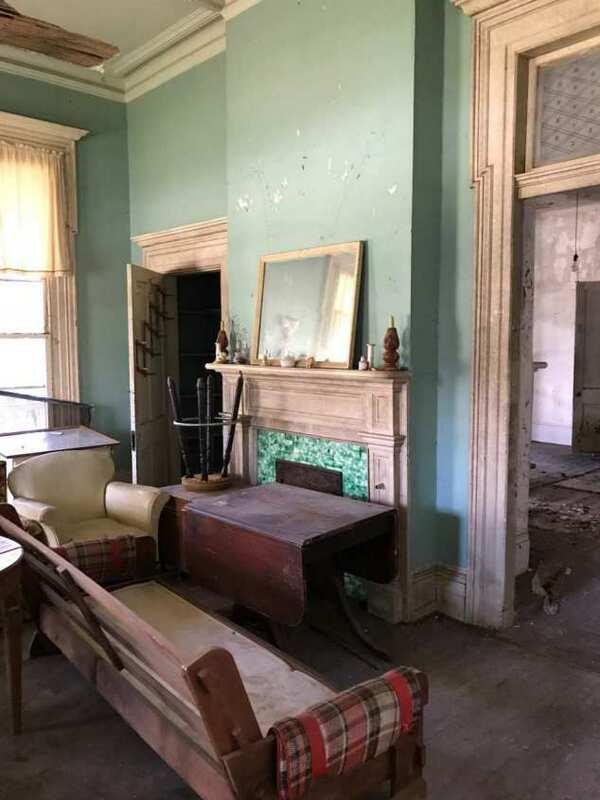 We are still trying to market our Victorian home in Texas (Fort Worth) so that we may move on to our next and likely final old house adventure. Under different circumstances, we might be planning a (first time) trip to Georgia. However, I feel confident the Little-McDaniels Family home will not be lost. 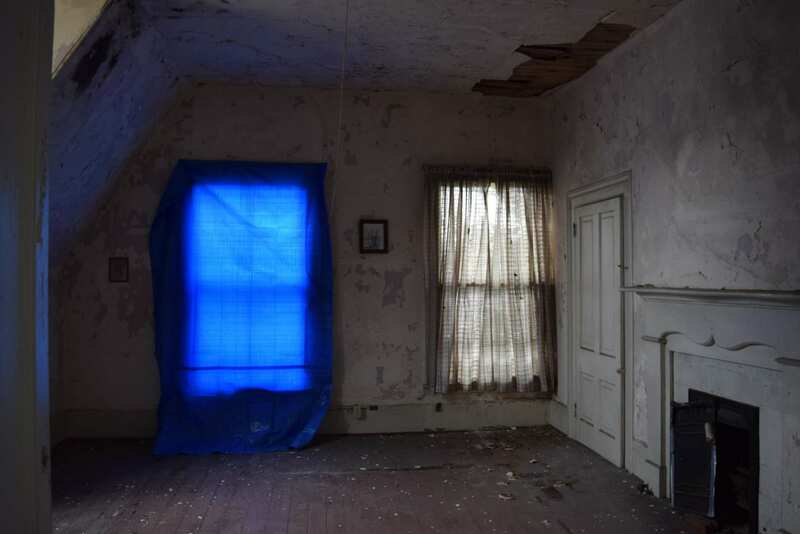 Thanks as well to all of the readers who’ve shown their warm support for this faded yet important historic home. 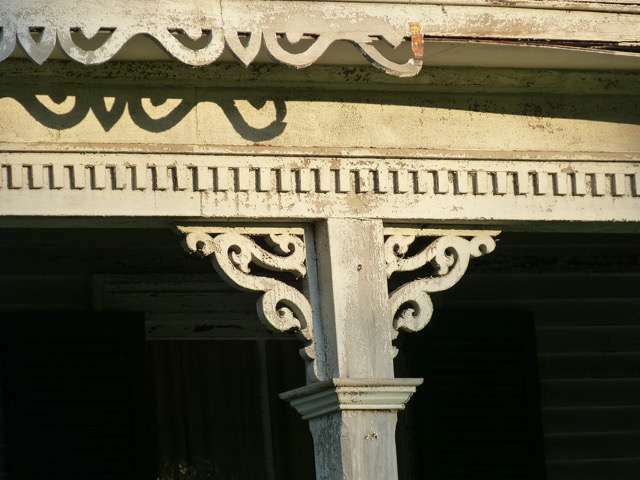 There’s a great old house community to be found here among the site’s pages. John Louisville is a great little town. I made a decision many years ago to raise my family here. This is home is right around the corner from me. I also hope someone will restore it. What about Grants to fix it up? I shivered at the realtor’s suggestion of offices being put in. I pass so many grand old historic homes in Augusta Maine that have been ruined by offices. Makes my heart hurt. I am a retired trim carpenter living in Mo. I lived in Louisville for nine years. I would gladly donate some time and talent to this renovation. ( a week or two at a time) Keep me informed of any future plans. This is a wonderful offer – please reach out to me through the Georgia Trust website. Thanks! That last picture is absolutely stunning. New life among the old. 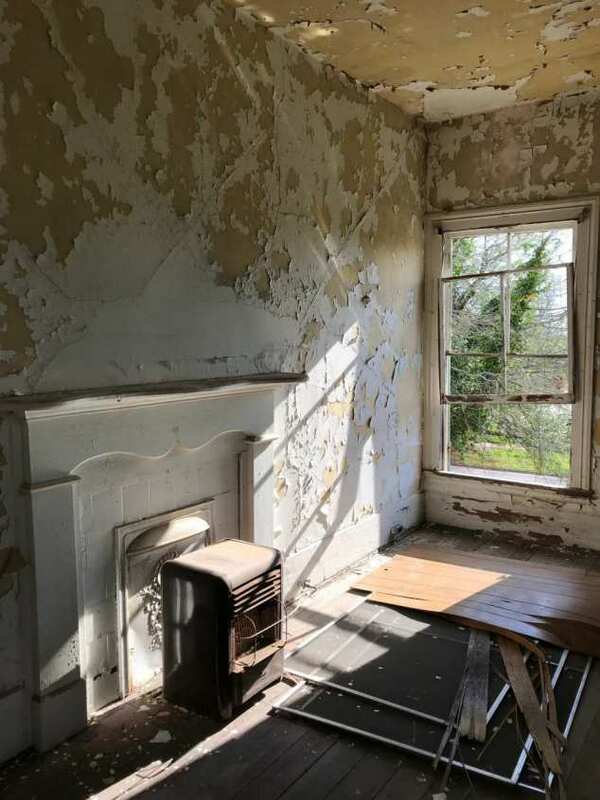 Kelly, thank-you for posting this one…… if only I didn’t live on the opposite coast, I could easily handle a restoration given my background and experience. But….alas, not practical to consider. Do keep us informed with photos, etc. plus progress on sale and restoration plan. There may be grant money available to a limited extent since it is owned by the Georgia Trust. Kudos to them for stepping up for this gem. I’m not sure it’s the GA Trust that owns it, think they are just helping advertise/sell it. My husband and I have driven by it multiple times and discussed investigating purchasing to restore. 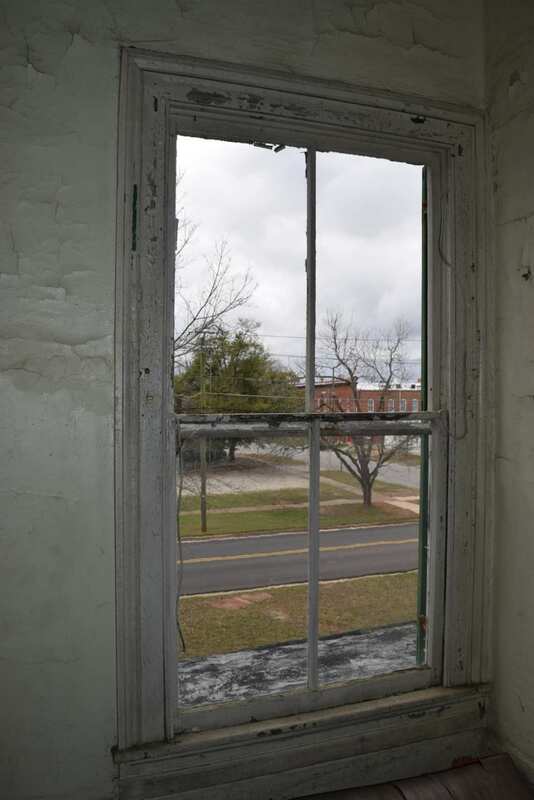 We own a residential construction company in Sandersville and have been able to be involved with several major restoration in our historical district. We are very interested in showing this property some love. My vote is for your family! 🙂 Sounds like you are on the right track with that background. Let us know if you decide to go for it. To: Terrie Veal : Was Miss Weenie McDaniel one of your aunts? I know she lived in part of the house when she & I both were younger. My Granny & she were best friends & years ago when I was much younger,I went to visit Miss Weenie as I called her. 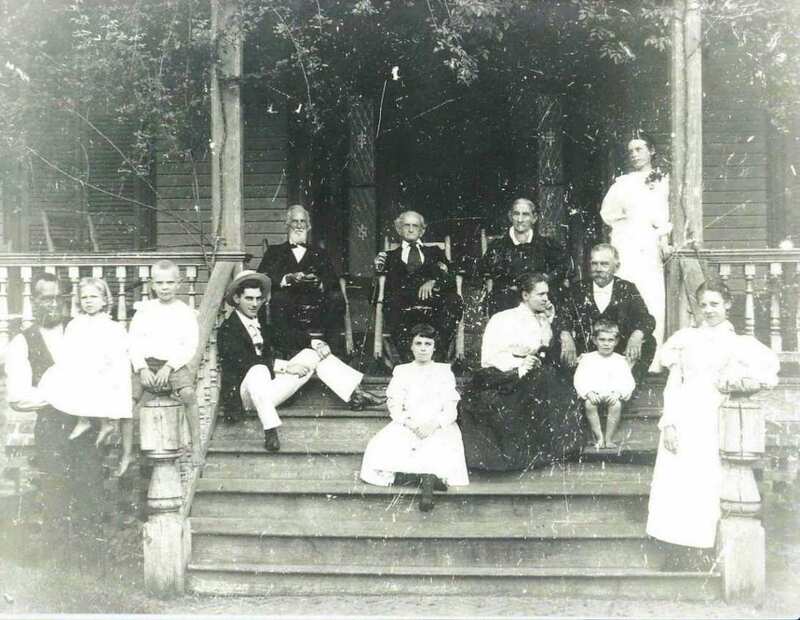 I live in Louisville, GA now & my Father, is originally from Washington Co, GA .
Here’s a photo of the Little family on the porch of the Mulberry St. house in about 1896. The owner James Cain Little (1846-1917) is at the right next to his 2nd wife Nellie. His mother is behind him and 6 of his children are on the porch. Little joined the Confederacy at 17, and later was a successful merchant, large landowner and president of the local railroad for 30 years. He married twice with 4 children from each marriage surviving. Priceless photo! Thanks, Jim. Not sure of the source, (it appears to be made from a glass plate negative, hence the small scratches) but the photo could easily be enhanced digitally and enlarged. 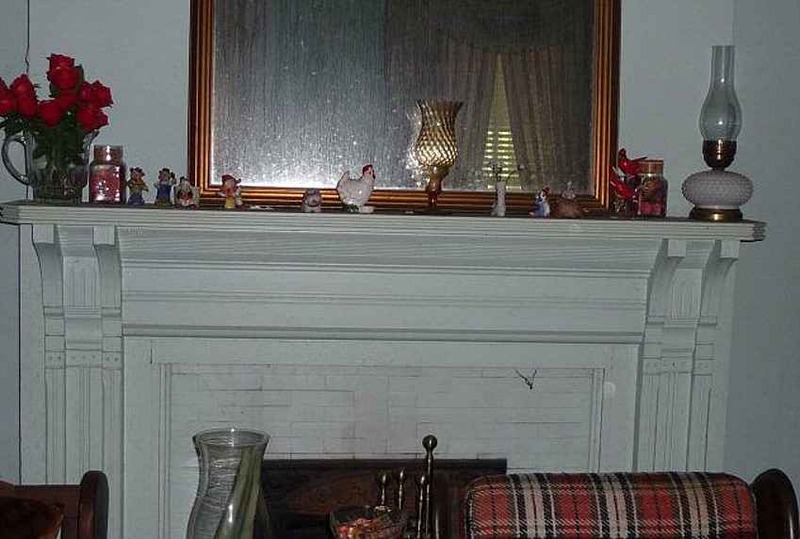 If it were my (next) home, I would enlarge the photo to 2 x 3 feet in size, then find a proper period frame to display it, and proudly hang it in the entry to honor the original Little family and its members who called it their home for many years. 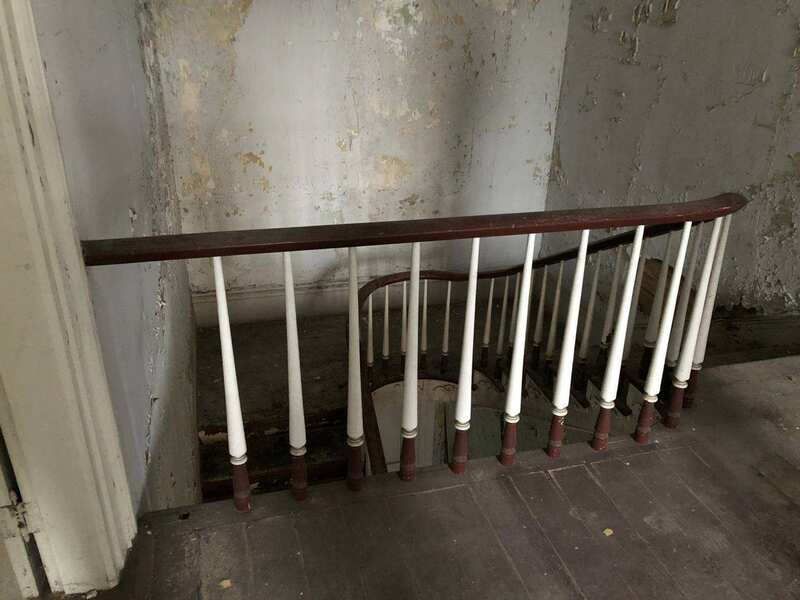 Another valuable find here is in the now missing details like the original staircase balustrade, (helpful when seeking City approval for a non code conforming replacement balustrade) the number and size of the steps going down from the porch deck, and the original porch newels (fairly easy to determine their scale based on surviving elements. 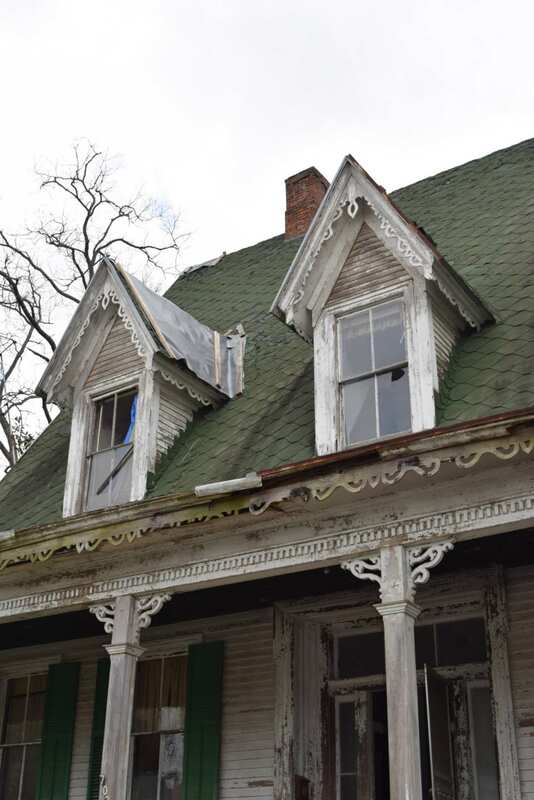 All in all, an exact restoration of this home’s exterior is possible that would meet all National Register, State, and local historic preservation criteria. 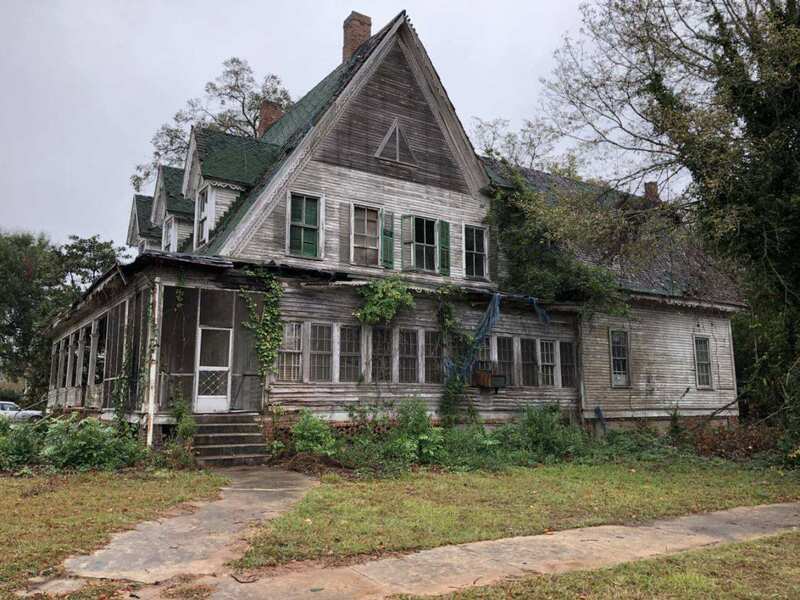 I think the crowning touch for this house and property would be a historical plaque with a narrative denoting its significance in local history. I think with extensive research, more information about the house and property could be discovered. I feel compelled to repeat that, to my eyes, this house is very nearly an intact time capsule. Thus, it truly deserves a painstaking and faithful restoration rather than a standard remodeling approach to look its best, in my opinion. Here is what I have discovered about the house. 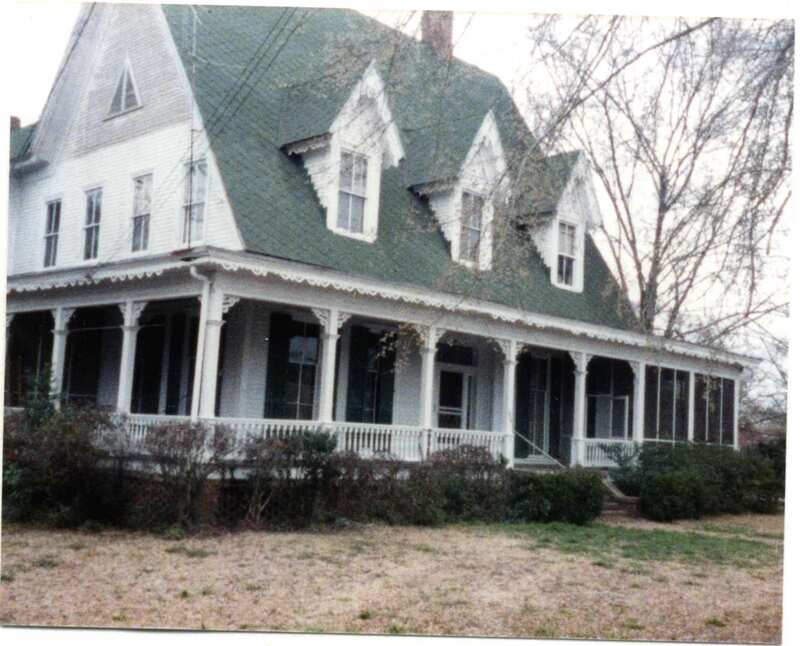 The house located at 702 Mulberry Street (commonly known as the McDaniel House) was built by James Cain Little in 1876. 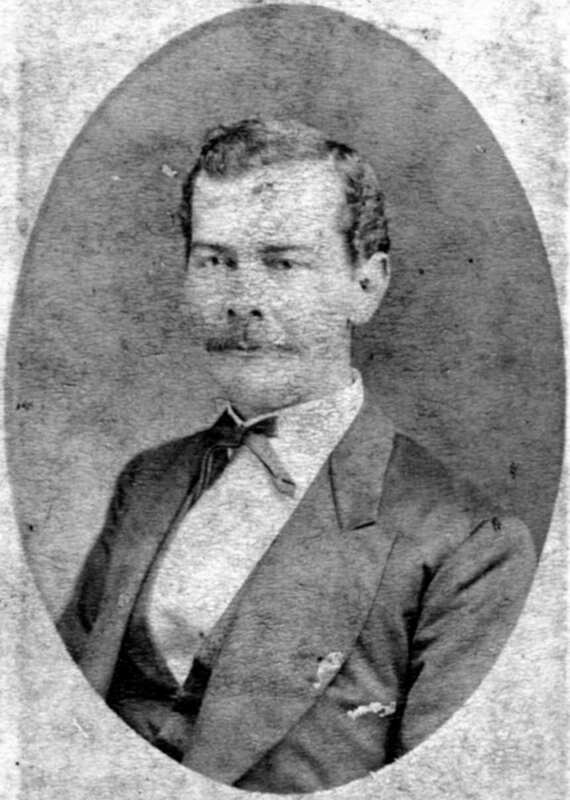 James Cain Little was the son of Robert Patterson Little and Elizabeth Cain Little, and was a prominent merchant in Louisville from 1869 through the early 20th century. Elizabeth Cain Little was the older sister of James Granberry Cain, who was a preeminent lawyer and judge in Jefferson County. J. G. Cain and Joseph H. Polhill were law partners for many years (1859-1902). In 1875, Mr. Little bought approximately half of the city block bounded by Mulberry Street, 8th Street, Green Street, and 7th Street from William A. Wilkens, one of the early large property owners of Louisville. The J.C. Little half was bounded by Mulberry Street, property of Eliza A. Roberson (later Watkins), Green Street, and Seventh Street. The purchase price was $2,000.00. In 1876, Mr. Little contracted with L. J. Guilmartin & Co. to build his large residence. The record shows that Mr. Little signed four notes totaling $4,000.00 and a security deed in favor of L. J. Guilmartin & Co.. Presumably, $4,000.00 was the construction cost. Interestingly, a few years later (in 1881) L. J. Guilmartin & Co. also built the Zacharius House (commonly known as the Pike House or Alexander House) on 8th Street, at a cost of $3,000.00. In 1915, Nellie P. Little sold the corner lot bounded by 7th Street and Green Street to her son, Augustine P. (Gus) Little for $300.00. Gus Little, who was the City Manager of Louisville for more than 40 years, built a brick home there and lived there until his death in 1971. 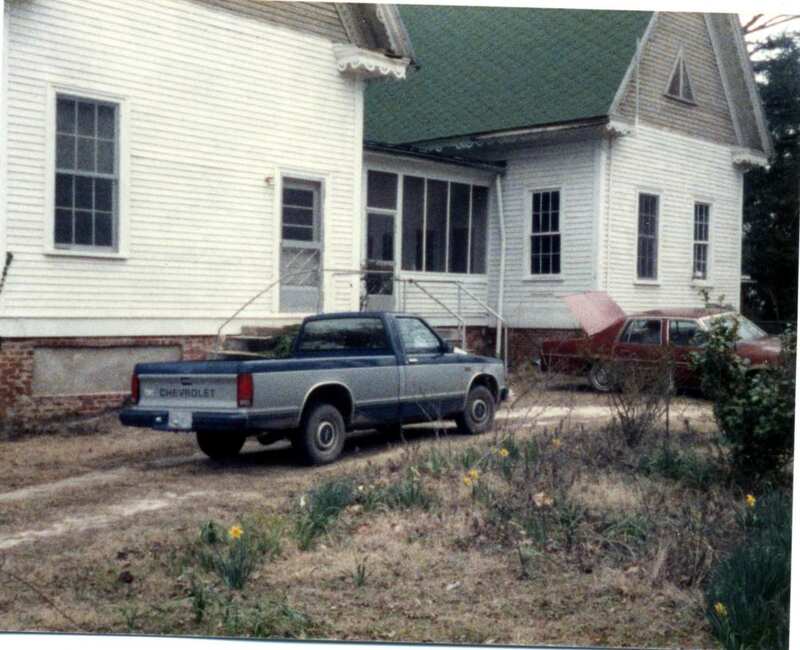 Gus Little’s daughter, Lee Little Romer, lived there from the early 1970s until her death in 2007. James C. Little died in 1917, and it is assumed that hard times followed. (Beginning about 1915 and continuing throughout the 1920s, the boll weevil ruined the cotton economy of the South. Many farmers, merchants, banks and businesses failed during this period. Mr. Little was both a merchant and a farmer.) The bad economic times became even worse when the stock market crashed in 1929, triggering the Great Depression that lasted until World War II. 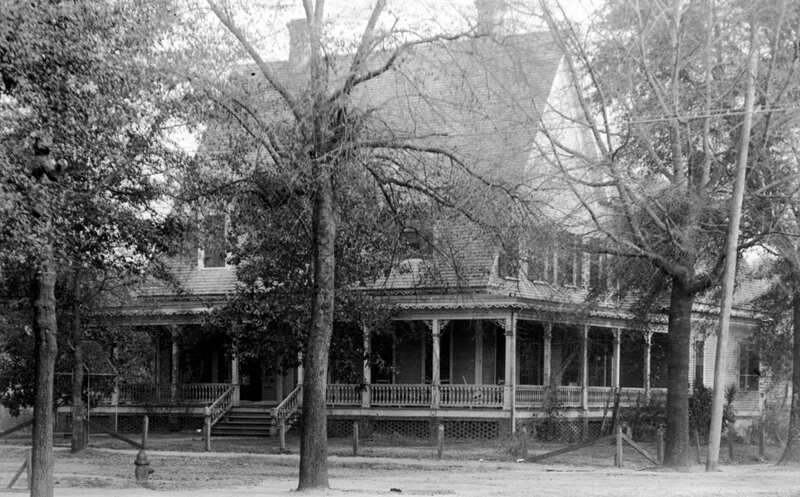 Nellie P. Little never remarried after J. C. Little’s death, and in 1924, she sold the residence property to C. W. Powers for the reported sum of $6500.00. 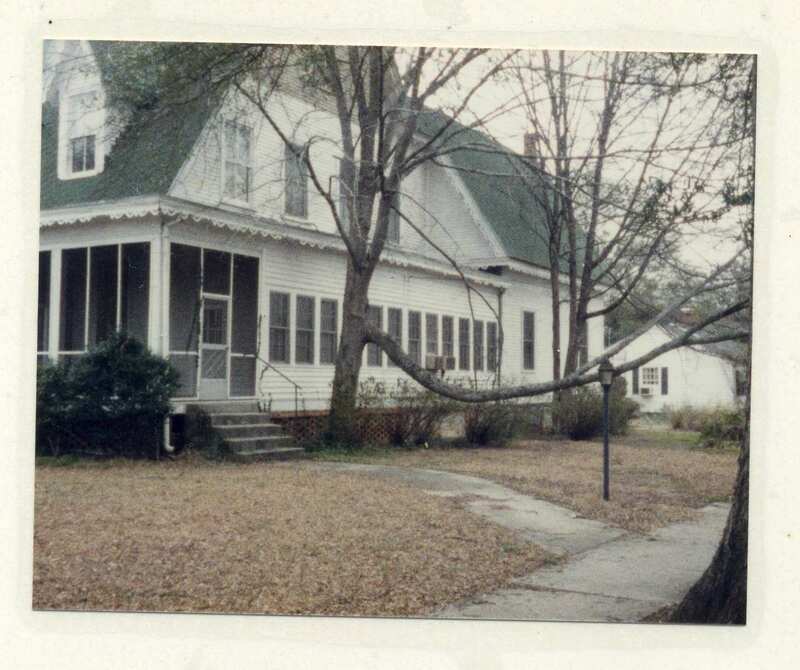 In 1935, C. W. Powers sold a small 70′ x 116′ lot to Nellie P. Little’s son-in-law, Fred J. Atkinson, for the sum of $420.00. On this lot, Mr. Atkinson built the small house now owned by Stanley Brinson Jones, Jr. In the 1940 Census records, Fred Atkinson stated that he was a druggist who owned his own drug store. Possibly that drug store was the Walgreen store later owned and operated by Morris Mink. 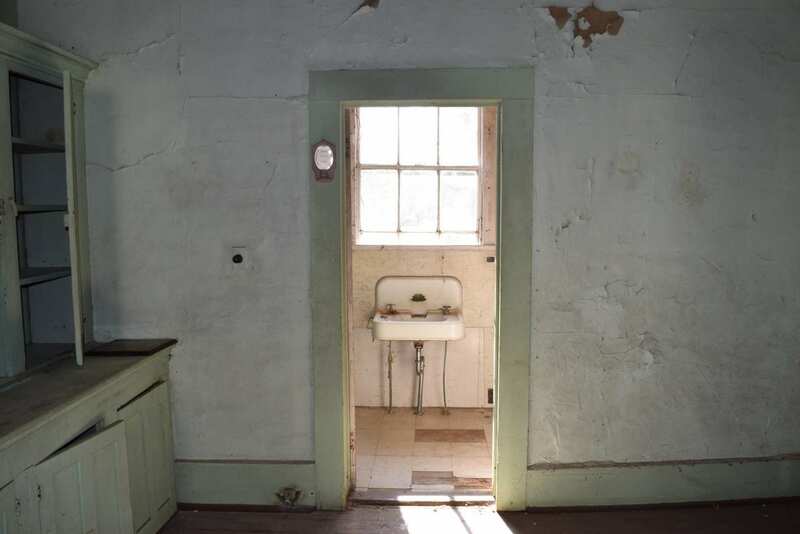 In 1937, in the depths of the Depression, Home Owners’ Loan Corporation foreclosed on the C. W. Powers property, and it was sold at auction to HOLC for the sum of $4,900.00. In 1948, the heirs of Minnie W. McDaniel (Joseph E. McDaniel, Paul McDaniel, Mrs. F.T. 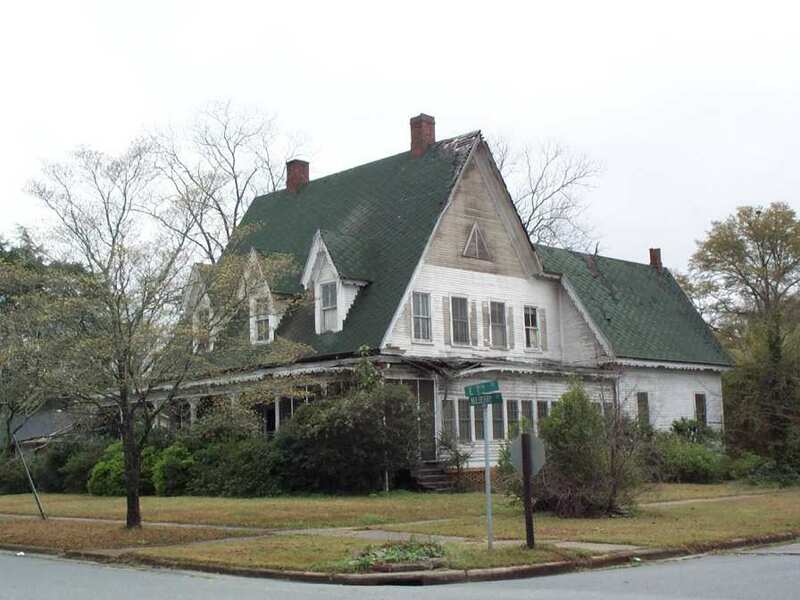 Ladner, and Ralph McDaniel) sold the property to Mrs. Winnie W. McDaniel for the sum of $7500.00. 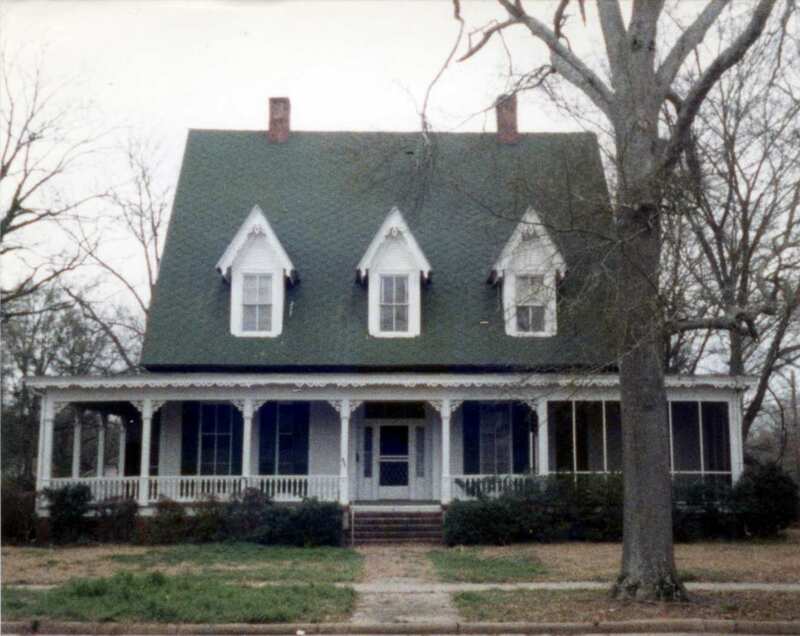 In 1961, Winnie McDaniel sold a 0.25-acre lot to Mrs. Marie H. Jones, who built the brick residence now owned by Lil Easterlin and Mark Wilmoth. The lot sold for $850.00. 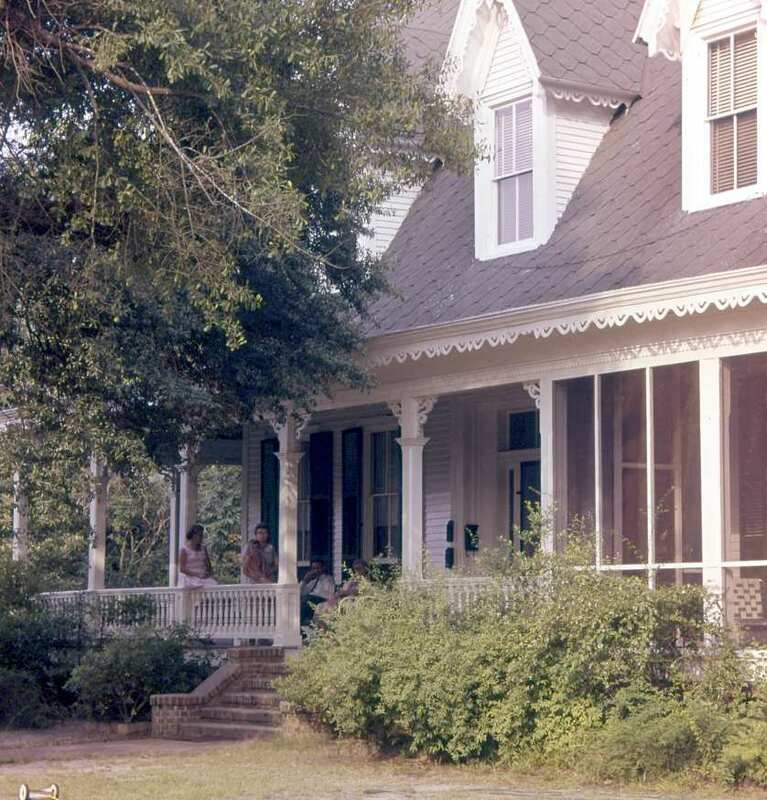 In 1987, Samuel A. McDaniel, William T. McDaniel, and Margery M. Banks ( children of Winnie W. McDaniel) sold the property to Eve Maria Griffin for the sum of $30,000.00. Oh thank you so much for the background history. How do you find it? I envy your research skills. Besides old houses, I love old silver screen movies. I watched one a few weeks ago and the house is the “narrator” and is saying “I miss my people.” I pictured so many of these grand old homes as I heard the lines spoken. Am quit bummed now that I can’t remember the name of the movie. Please, etzkorn, do let us know when you remember the name of the movie. The idea of the house as narrator is tantalizing. 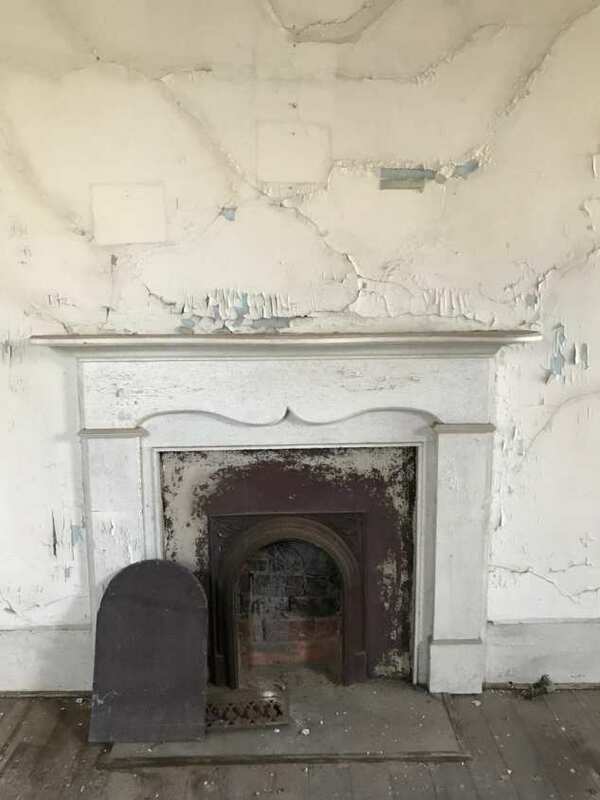 One of the romantic reasons I adore old houses and exploration of their story, both architecturally and historically, is the story the walls could tell us (and upon careful investigation, often do!! ), not just about architects and builders, but about families…… babies born, lives lived, beginnings and endings, and how they sheltered and contributed in real ways to all of it. The whole movie is worth a watch – bittersweet love story if you are into that genre. “This Happy Breed” from 1944 may also interest you. It posits a reason why an old beloved house is left: it no longer serves its purpose as the family unit shrinks and only parents are left in a big empty house. This movie is also found on YouTube. Hope you enjoy. Thanks so much for the movie info. I love anything from the 40s, music and even the colonial revival furniture, ranch houses, etc. And…..I’m just a sucker for the romantic!! Thanks for sharing the “photo-essay” article about this house featured in the United Kingdom based Daily Mail. 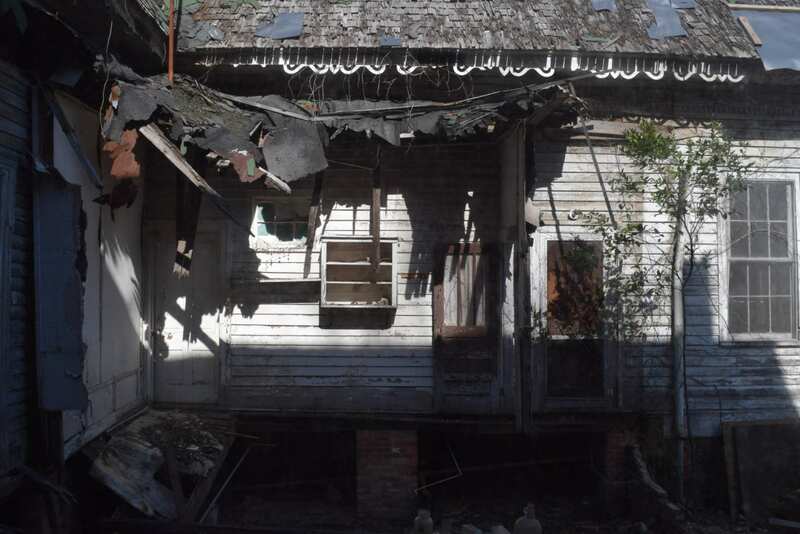 I believe for this house to be saved and restored, no amount of public exposure and media attention would be excessive. I keep looking for a “Sold” to appear on the heading. 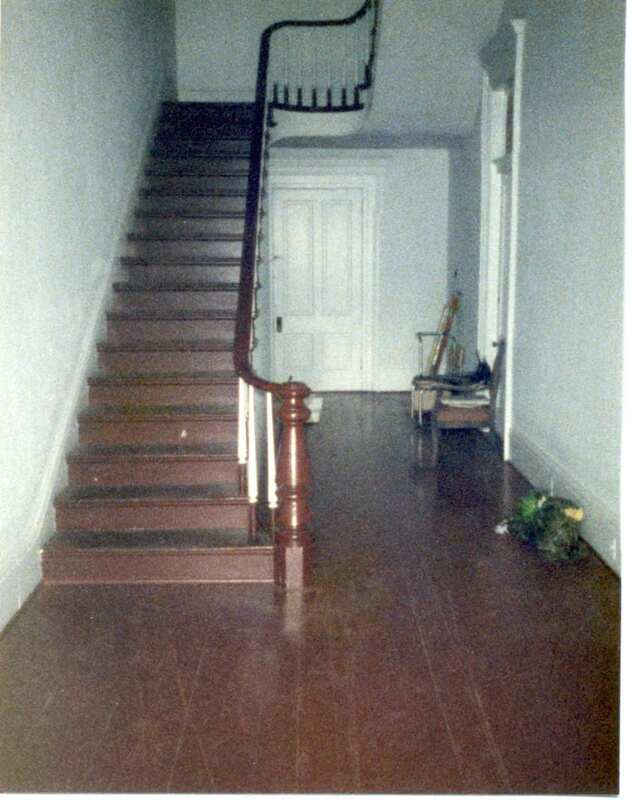 This reply is to the man with the photo of the front steps, Jim H.
I need a copy of the Little Family on the porch steps picture. 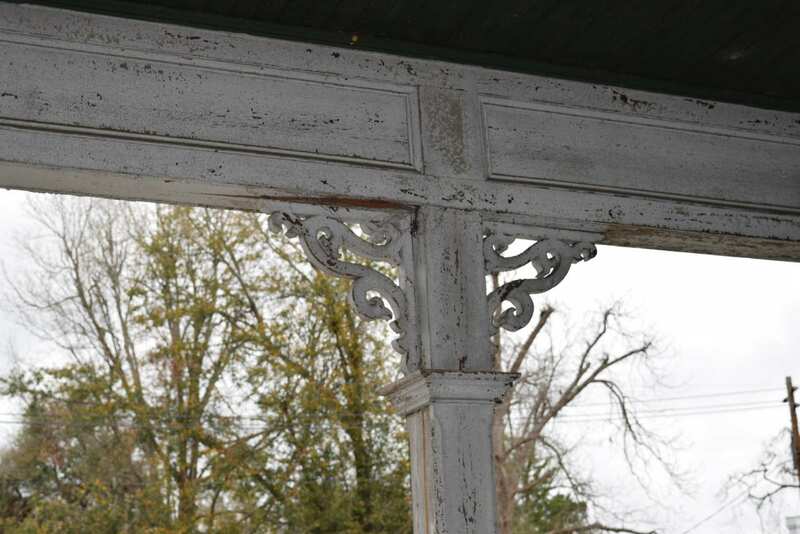 The house now does not have the huge front post, I would like to have a set copied for the restoration of this home. This has always been one of my favorite family photos. And it only hints at some of my favorite family stories. The two older men in the photo are JC’s two fathers-in-law (he was married twice) and there are many tales of the two men arguing over any small detail, right down to the weather. One would say that he thought it would rain that night and the other would immediately refute the forecast. That daily breakfast table conversation would have been most interesting. Boo Radley would feel at home here. 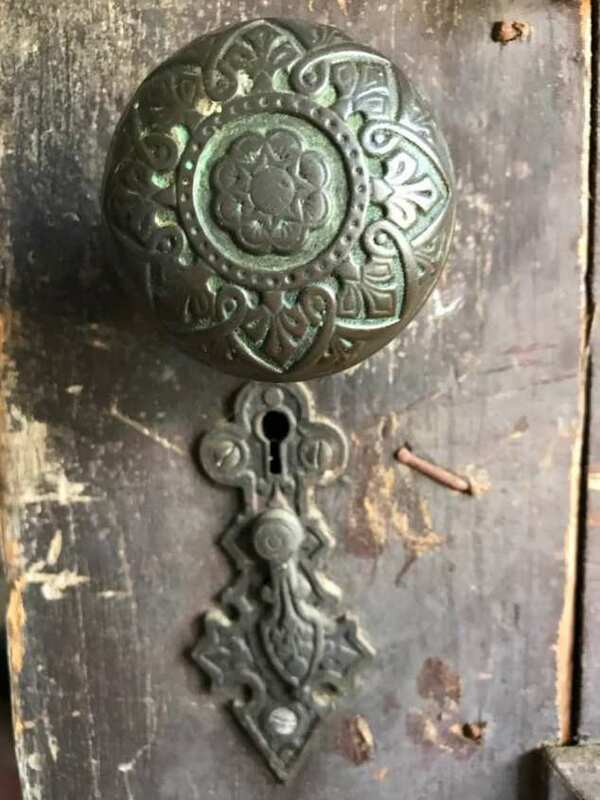 I want to take a moment to say how great it is to see posts from people who are looking into buying this one. I think there were three? They were all genuine and heartfelt, so you know what? We love you. Go for it. And if I am being honest, that picture AND the story of the woman with the aunts made me teary eyed. This one got to me. 2 1/2 hrs east. Closer to Augusta. A nice day trip, if you’ve a mind to go. Take pics! Like everyone else, I am so taken with this house, and the photo of the Little family sealed the deal. For me, the kitchen is a dream…LOVE the sink! 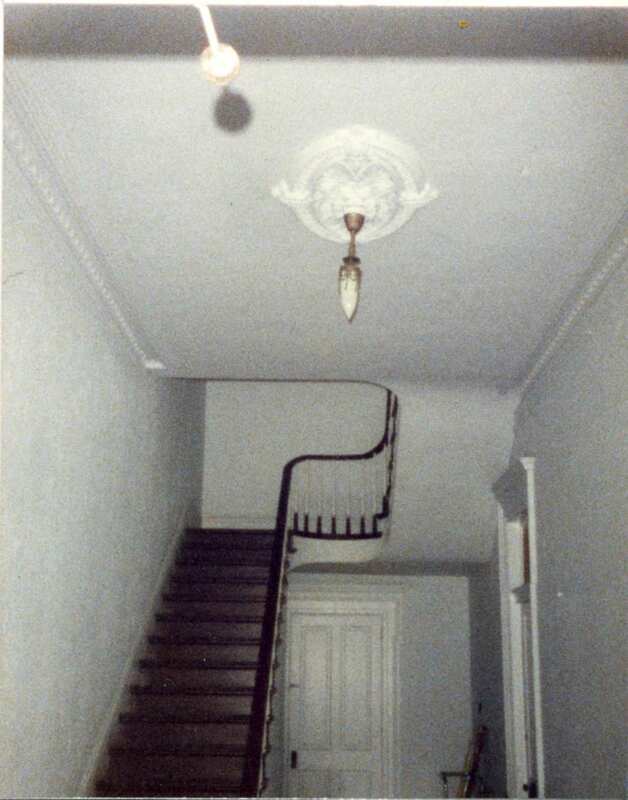 Also, the photo looking up the stairs, showing that beautiful curved banister and the light flooding the landing…I can see that in my mind, restored and ready for another century of family photos taken there. (Imagine it at Christmas!) I hope this home goes to someone who loves her as much as she deserves, with the skill and wherewithal to treat her right. And please please please, don’t let a flipper have her! This place is wonderful. 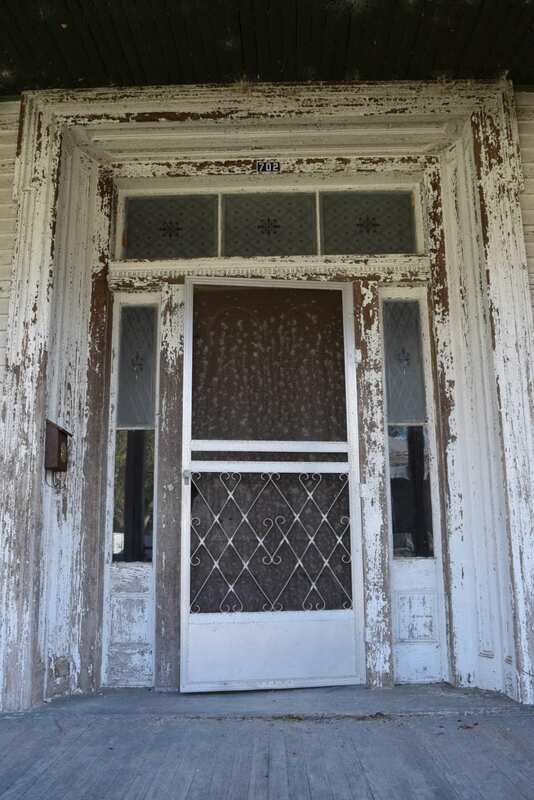 The porch & those windows in the 3rd photo…….We just don’t have old architecture that even in this sad condition is fun to look at up here….. Couple more pics on realtor.com show the kitchen before the destruction. Maybe Steve Harvey has deep enough pockets to save this beauty! This is the coolest house I’ve seen in a very long time. It’s STUNNING, love the architecture the most. Please don’t let it get lost, PLEASE BRING HER BACK. wow. 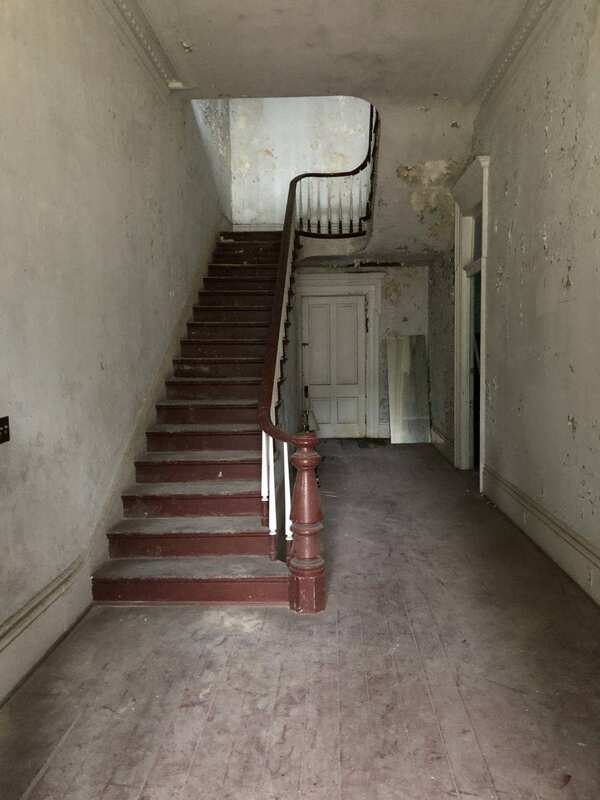 This is a amazing property,Its unique,The possibilities are endless.A very grand home.The price is affordable.But the restoration could be unimaginable. Who ever challenge this project.Will be very pleased with the out come.This is a beautiful home.I wish I was financially able to take the challenge. There are no words left to say, you guys have said it all. If this house is bought by one of OHD members, please start a blog, facebook page or something so the rest of us can go on the journey with you. I just gave 100.00 to the Georgia Trust. I put it in honor of Old House Dreams for Little House roof. I JUST LOVE THIS HOME! With some love, this home could be an amazing showplace! And at $15,000…it’s a steal. I hope someone saves it and loves it. 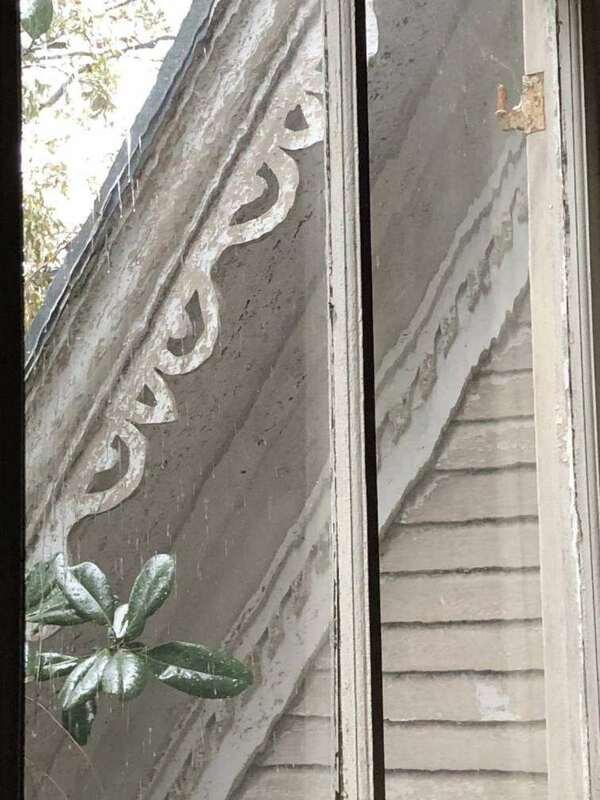 I live right around the corner in a home that was built in the 1800’s. My home has been restored, and I really hope that someone will purchase this home and return it to it’s grandeur. This one is in really bad shape. 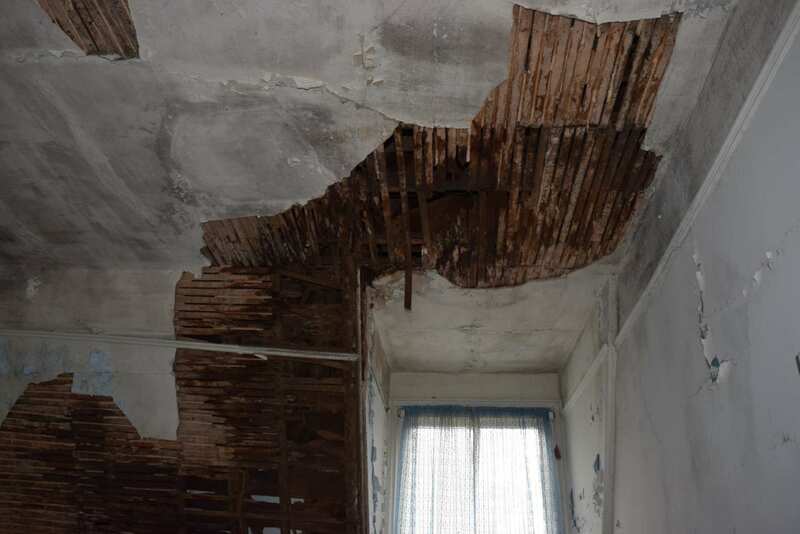 The very large hole in the roof was there for years. Not months, but years. 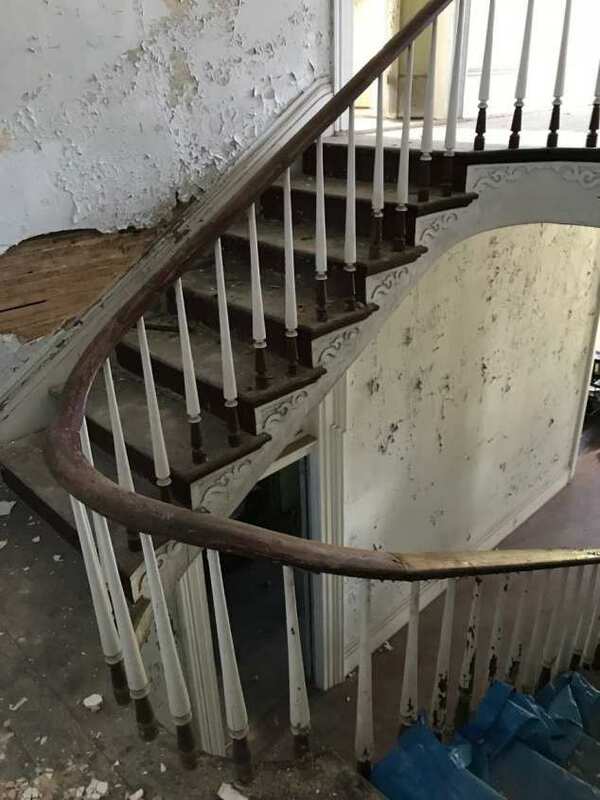 This restoration will not be for the faint of heart. 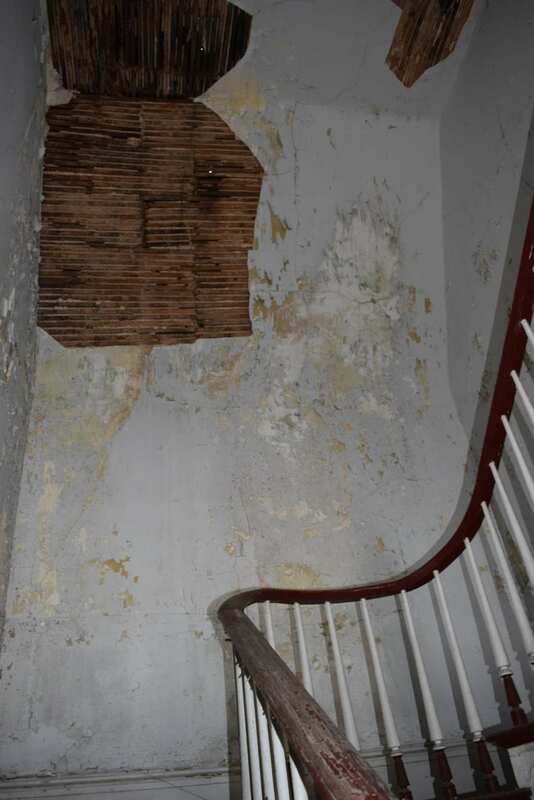 To put this home back to the condition it deserves to be in will take hundreds of thousands of dollars. I would hate to see someone buy it and make a mess of it due to not having the funds to see it through to completion. Exactly the point I was trying to make in my previous post. 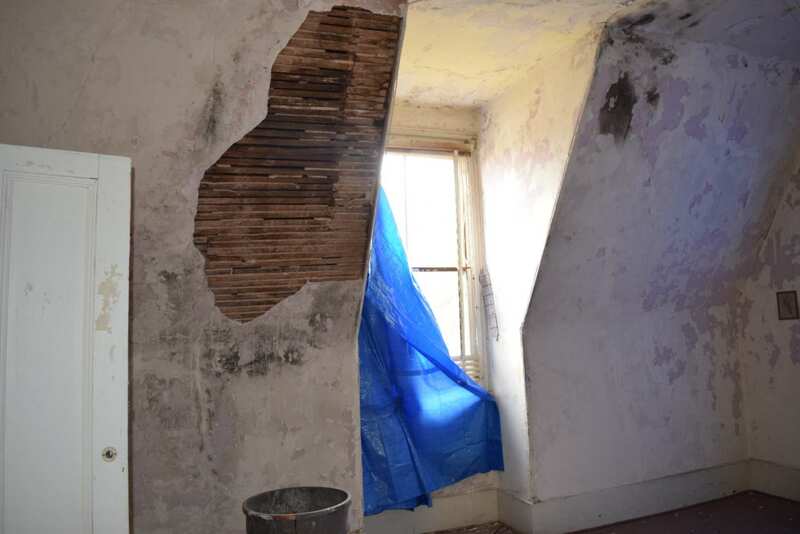 What I’ve learned in my restoration / renovation experiences is to make a sensible estimate, then double it. I totally agree Jason. A restoration of this magnitude can be a budget buster and then some. 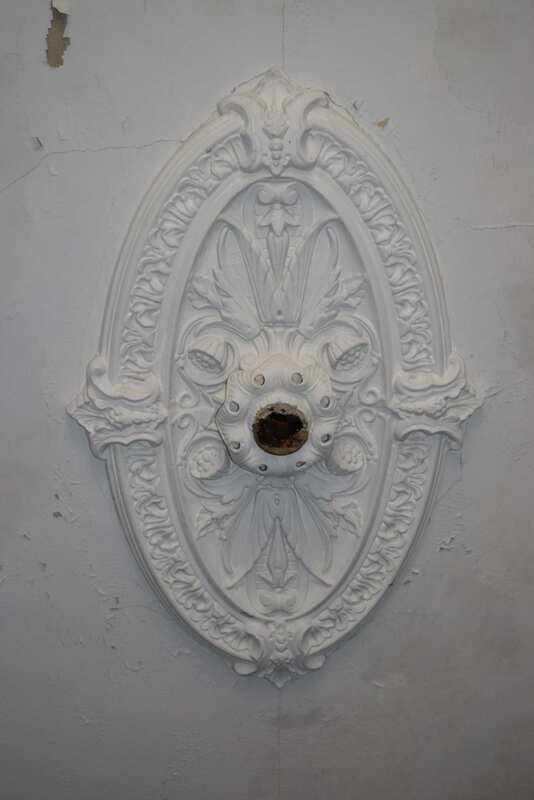 There is nothing worse than a hacked up restoration job. The home deserves better. The thing is, there is something worse, letting this house decline further to the point where it is demolished is infinitely worse. I agree Joe. Unfortunately it is not far from that point now. Have you ever seen the home in person? I regret to say that I am not in a position to do so, I’d love to take pictures of every detail. It seems that you might be in such a position. It has been posted that the GA Trust’s representative is going to take lots of pictures and post them here. If he doesn’t, will you? If I get granted access to the property I will be glad to. I keep coming back to this post to look at the pictures and to see if anyone posting here has purchased it. I’ve only done that with one other home on this site (or any site,) and that was just to look at the pictures and sigh. That tells you how captivating this one is. I have developed an emotional attachment. Like many, I keep coming back to this house, every day because it keeps getting comments and I am reminded when I receive the e-mails. It really engages my imagination. So, since I am a big talker about my ideas, I am putting this one out there. This is not a complete plan, it is more of an outline of my idea. It would need someone else to implement it. If you have the qualifications to do so, please, take it and run with it, if not, perhaps you could say what kind of money you would consider yourself comfortable with donating in a way that might give you eventual ownership. How about a house raffle? Here is how I would work it. There would be no limit on the number of chances sold. Those buying the chances would have to acknowledge that they understood that they were making a donation to a fund that entitled them to one chance in a drawing for every ten dollars contributed. 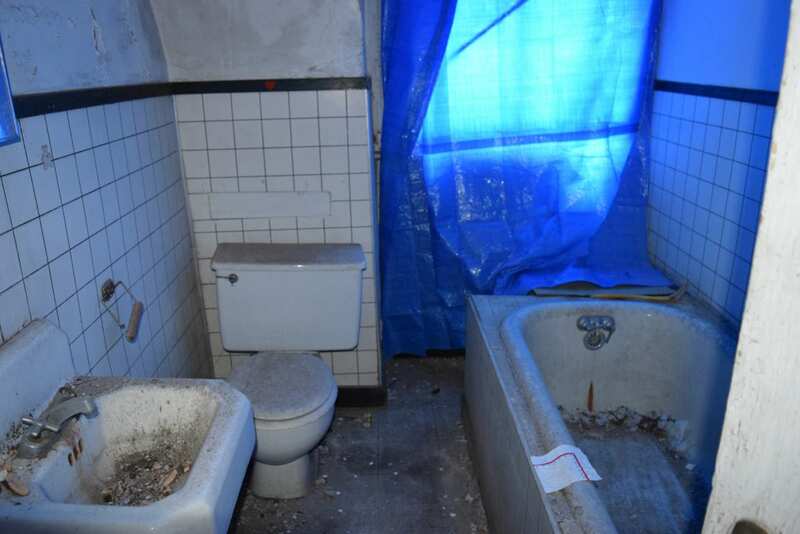 Chances would be sold until the renovation of the house was finished. Any money that was left over would become seed money for another house to be chosen by the board of the corporation. from the houses posted on OHD. Chances could be given as a gift to someone else if that was stated in writing. Some of the money would be reserved for the costs of writing and operating a blog about the process, which would let people know the trials and tribulations of the rehab process. 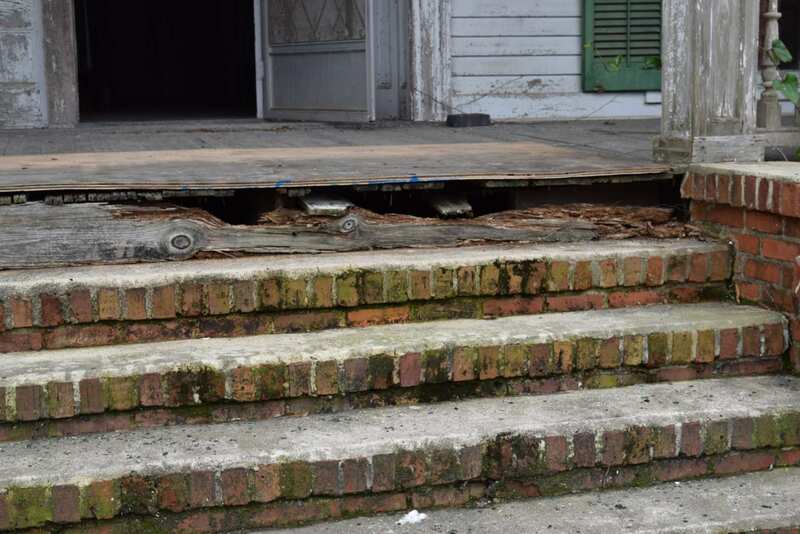 Decisions concerning the rehab would be decided by a board composed of people who have put informative posts on OHD that have shown a sincere interest in a rehab that is sensitive to modern needs and the importance of an historic preservation. reserve fund established The study would need to be updated on a regular basis and fully funded by the new owner. The owner would be required to make the payments recommended by the latest study into the reserve fund. If the owner is unable to make such payments, then they would be required to sell it to someone who can. 2. a qualified group to serve as a board of directors and a qualified contractor to do the work. 3. Someone to oversee the process who also has the ability to write and take the photographs for a blog. Although anyone could make comments on the house and its progress, there would be no requirement that the board make improvements based on anything other than the board members own judgments. I would prefer to see someone like Ross or Kelly in an official advisory/overseer position when it came to the blog and web site. 4. Volunteers who are able to work with the contractor. 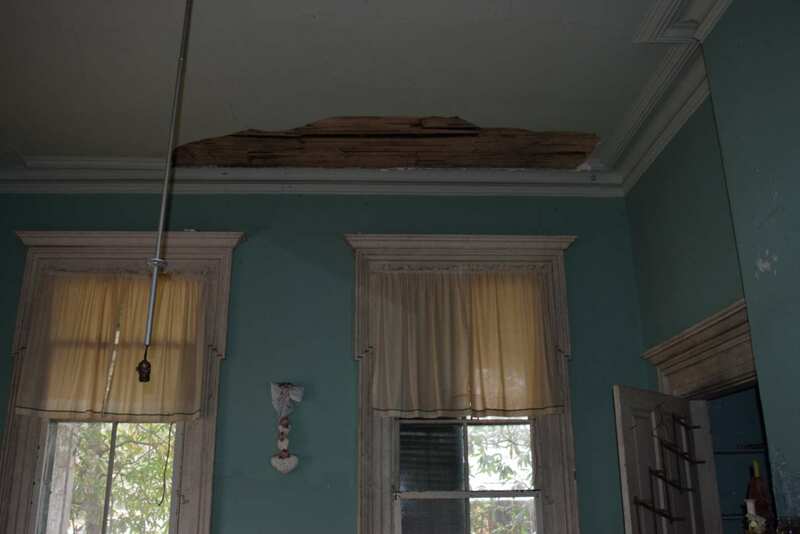 The stabilization of the house and exterior restoration would have the first priority. If the chances sell well, the restoration would continue. If it was the determination of the board that there would be insufficient chances sold to complete the renovation, then they could choose to announce a date that the raffle would be held. 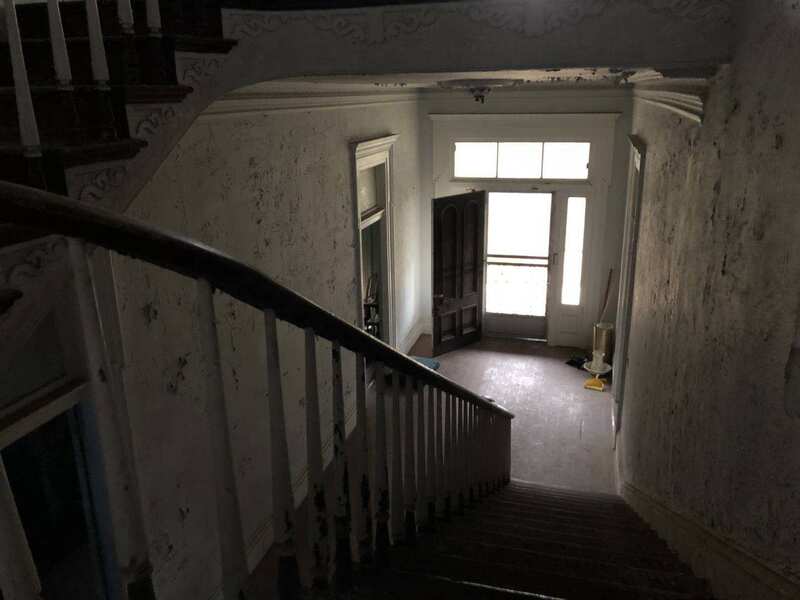 If the announcement of a date brought such a large sale of tickets that the board determined that more step could be taken in the restoration, then the date of the raffle would be postponed until the money had been spent on the house. These are the ideas that I have had, but there are so many who visit this site who also have really good ideas who may have better new ideas that will be added to or replace mine. Maybe you could suggest other steps that I have missed. Please feel free to throw your ideas out there too. I am not currently in a position to buy many chances, nor take any position in the rehab, so I am putting the idea to any who might be able to take it and run with it. I think that there might be OHD followers who have the knowledge and experience to serve on the board, yet are financially secure. If they also have the time to give without negatively impacting there own well being, it could work. If it works, I would think that it would have a very positive impact on board members’ well being. Again, look at Ross’s experience with his blog. Another web site lists this house as Sold 8/17. YouTube has a video by Proper People with this house. This home is still for sale. The 8/17 might be when it was transferred to the city. The lot is very small. Possibly a motor home could fit, but it would be tight. There are places to rent here. It delights me that there is a place, where a resident considers a 2/3 of an acre lot to be small. It really must be a garden spot! Thank you Ben from Georgia Trust, many more photos added! Yes! Many thanks to Ben. I feel like I’ve toured the house now. 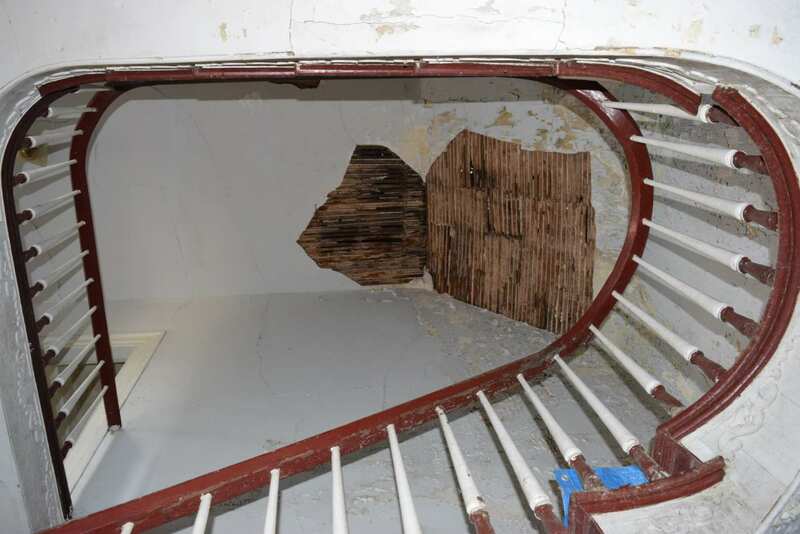 My opinion about this remarkably intact home hasn’t changed. I hope to soon read here that someone bought it and plans to fully restore it. -Of course from my reading of his blog, I don’t think Ross actually knew that he was what I called “a Ross” above until after he had purchased the Cross House and started his blog. If he had found a MCM, which he stated that he was seeking at the time, that had met his needs earlier in his house hunt, he may never even have bought the Cross House, nor explored what appears to have become his passion, it’s restoration and that of old houses. He may have remained on the sidelines like so many of us. Lip service is great, but doing has more rewards. We can’t really clone him but we can and do learn a lot from him. Now I have to go look at the new pictures again. There goes my day. Just came to say I love this house even more with the extra pictures. I have a mental picture of what the back looks like all fixed up, with beautiful flowers and a sitting area. Dreaming! Thanks Jeffrey and his friend Molly, more photos added! If its still for sale in the next 2 months we will probably buy it. The “drapery” millwork around the windows is BEYOND gorgeous! I’ve never seen anything like it. Breathtaking. Kathleen lives in the neighborhood and sent in a few shots from downtown Louisville and the home. Any news on this place yet, Kelly? I wonder if this house holds the OHD record for most comments. I also wonder how many people keep checking back in case there’s some good news. Looks like that poor house across the street needs saving as well… is it for sale also? 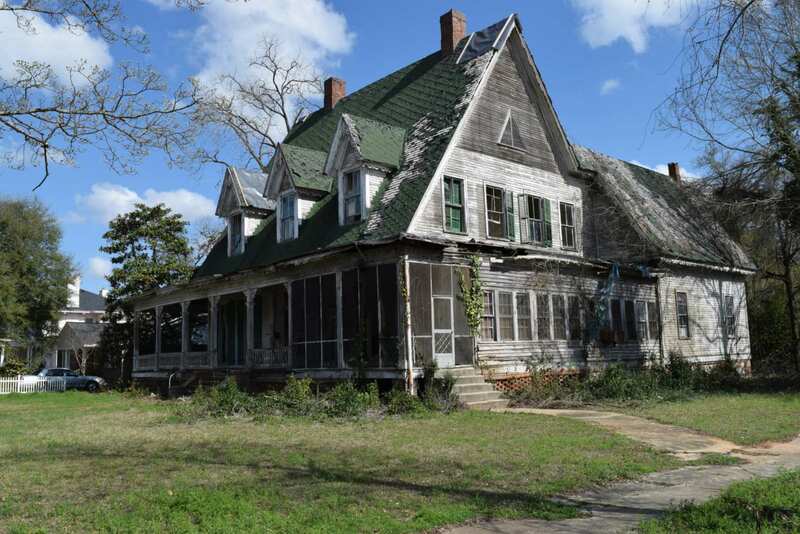 I prayed that if I won the lottery I’d buy this home and restore it. I won 15.00. Does that count? Hey Momma……it’s a start!!!!!! Maybe next week, who knows???? 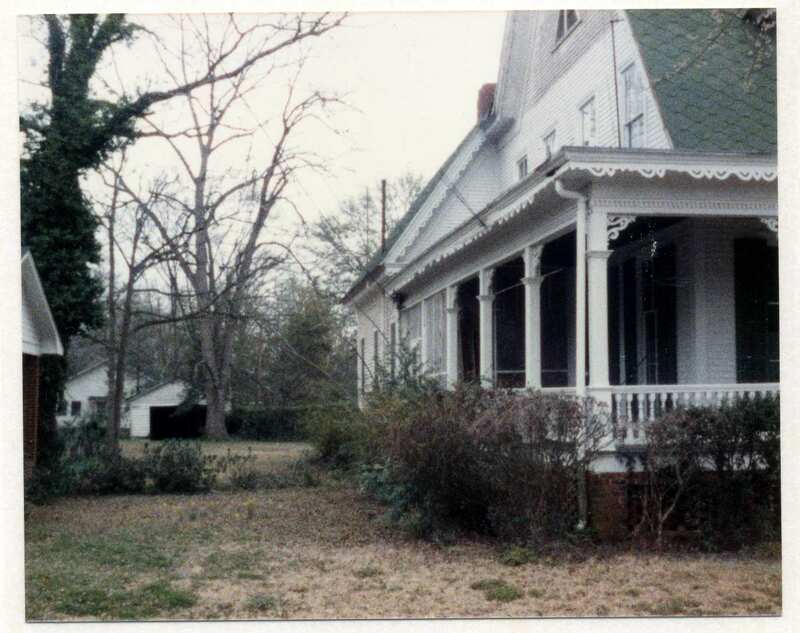 Photos from David L. showing the home in 1900 and of James Cain about the same date. The new photo is from 2001. I keep coming back to this house every week to see if it has sold. These new photos make it more tempting. I haven’t checked in a month or so, but I’d venture to say this is one a lot of us haven’t forgotten. Great to see this one pop up in the banner this morning. Always a pleasure to see a fine house like this again. Hope some stabilization can happen soon. When this home was 1st posted I fell head-over-heels in love, and all these months later, I am still in love. 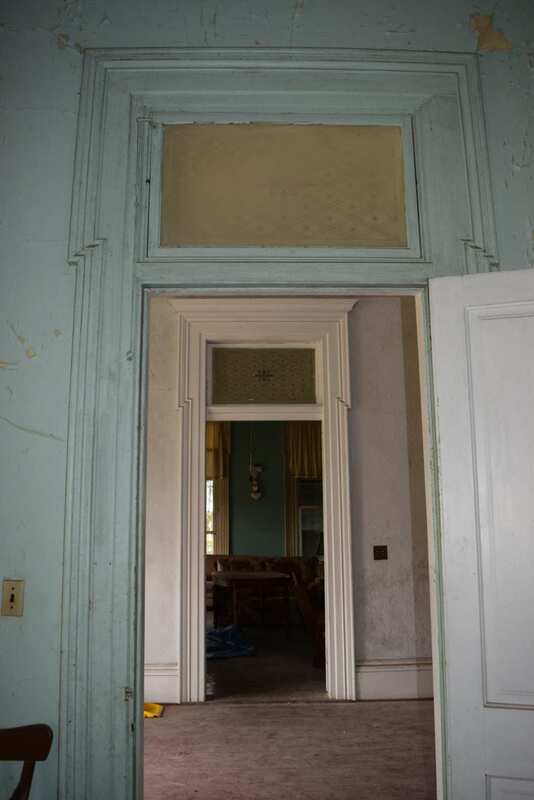 I wish I could fast forward 4 years, because I would be in a position to purchase & renovate this beauty. As of right now that would be a difficult task – commuting from WI. I can only hope that some lucky soul saves her from destruction. 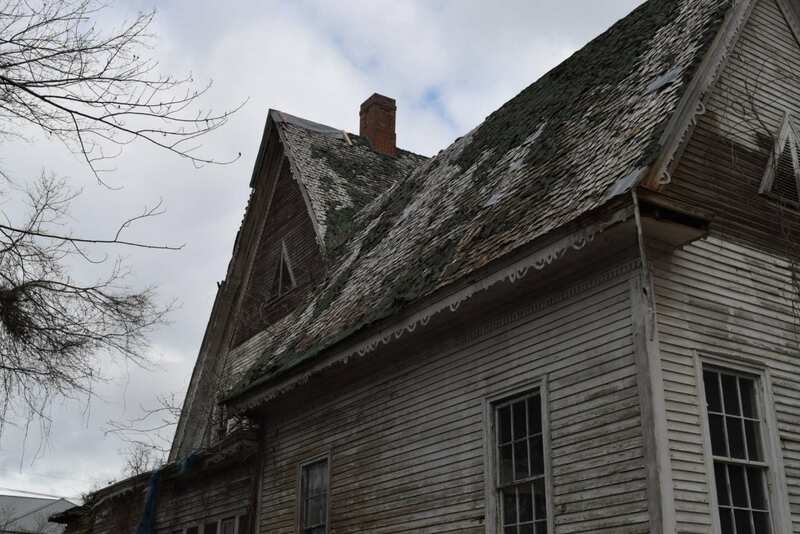 This house, although needing serious repair and love, still stands and still is beautiful. And because of this, the house is very special. As another of those who love this house and wish that I could be “the one”. I called Ben Sutton at the Georgia Trust for more information. The info that I found to be the most interesting because I didn’t see it posted here is that the lot is an “hourglass lot. The property’s a square section at the corner that we see and then another square that overlaps as in an hourglass, which is in the middle of the block. It seems that the original lot was square. Two separate lots were cut out of opposite corners on either side of the house leaving the shape of two squares with overlapping corners. This house is so beautiful, even in this state. I hope someone will come along and give it some much needed love but if its turned into office space, I might cry. I was hoping someone who has seen inside the house, would be able to tell me what the floor plan is? I’m having a hard time picturing where/what all the rooms are. 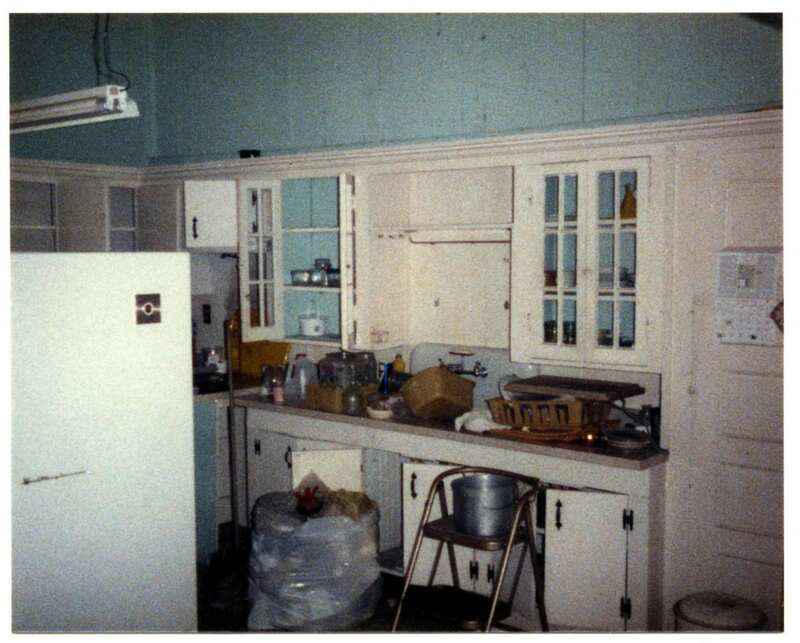 I’m guessing the kitchen is in one of the two rooms shown in the pictures in the back of the house but what is the other room for? Bedroom? I saw 4 doors leading off the landing at the top of the stairs so that’s the 4 bedrooms and one of the bedrooms has a bathroom but where is the other bathroom located? Seems like a big downstairs area for kitchen, dinning room, living room, bedroom? Bathroom? I don’t know. I hope someone can let me know. Thanks. Did someone buy this Beauty Kelly? Yes, a readers friend is buying it. 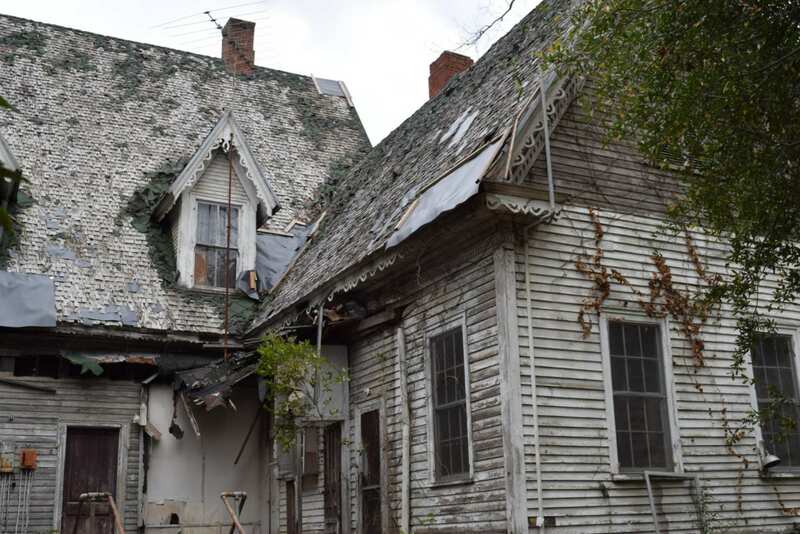 They’ve restored homes before so I believe if all goes well this home will be saved. In response to Harriett’s floor plan request. I do not know the original floor plan, however, the following is my recollection of the layout during the 1950’s and later. My grandmother, Winnie McDaniel, owned and lived in this house from the early 1940’s until mid 1980’s. We visited there about every two-three years on family trips from up north. 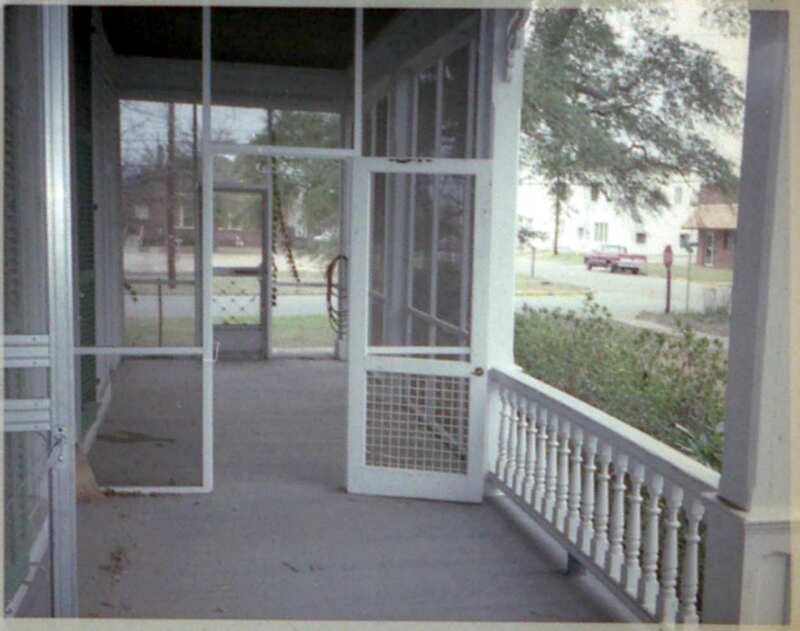 Looking at the house from out front, on the right porch you will see the entrance to her Beauty Shoppe. The actual salon chairs, etc were on the side of the porch. 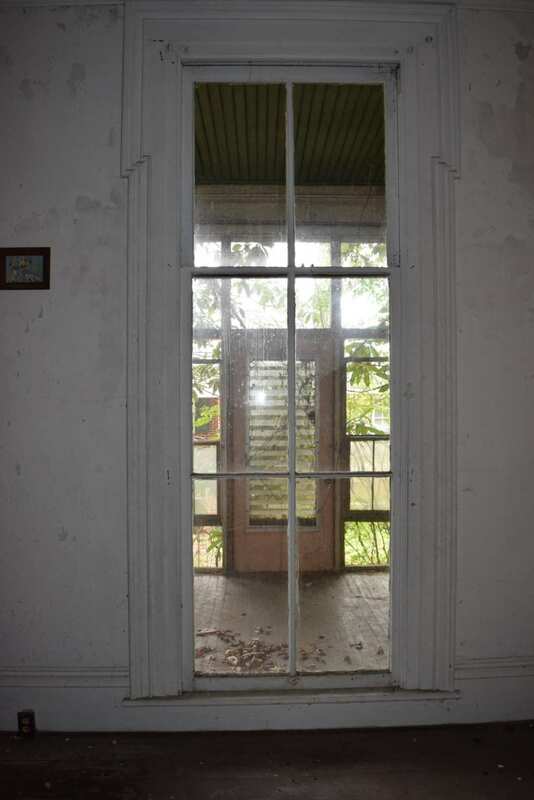 The ‘inside’ entrance to the salon was through her bedroom window. (cracked my head on the window numerous times). Grandma had the house split into three living areas for herself and one or two sisters. Her rooms were on the first floor, right side. 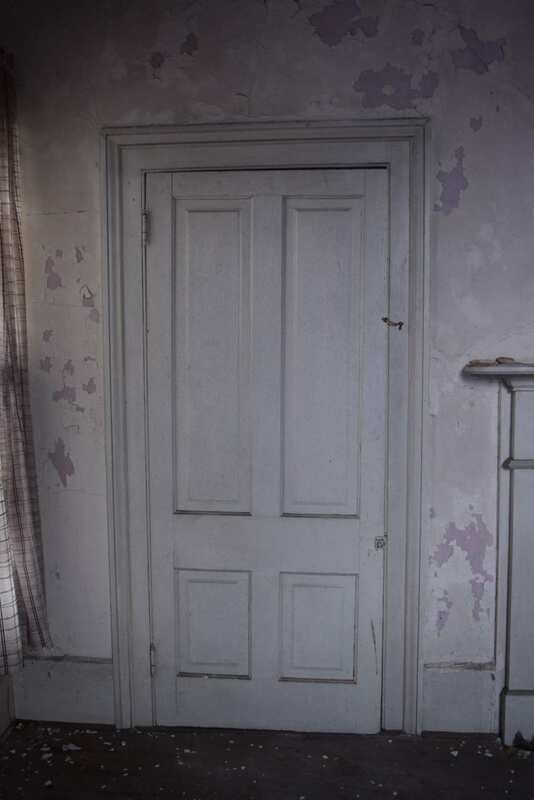 The first door on the right went into the Living Room. From there the next room was her bedroom (with access to the salon). 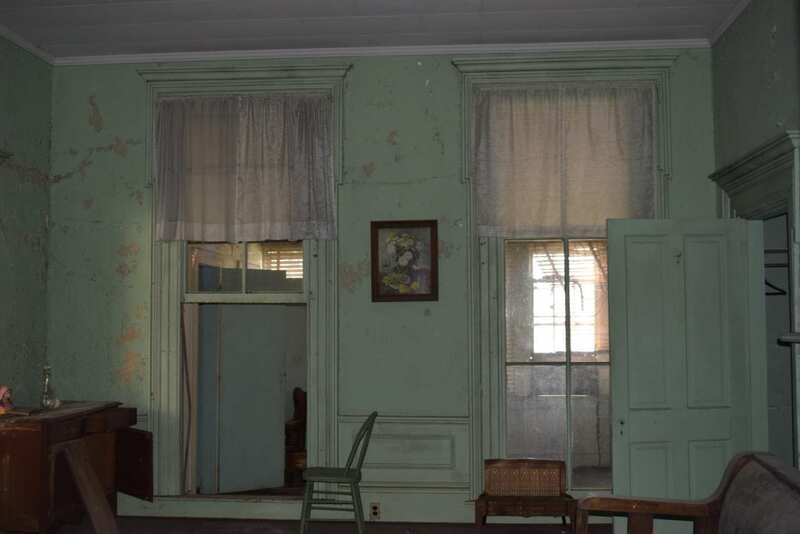 The left side of the first floor was likely a near mirror image of the right. I don’t remember spending any time in those rooms. 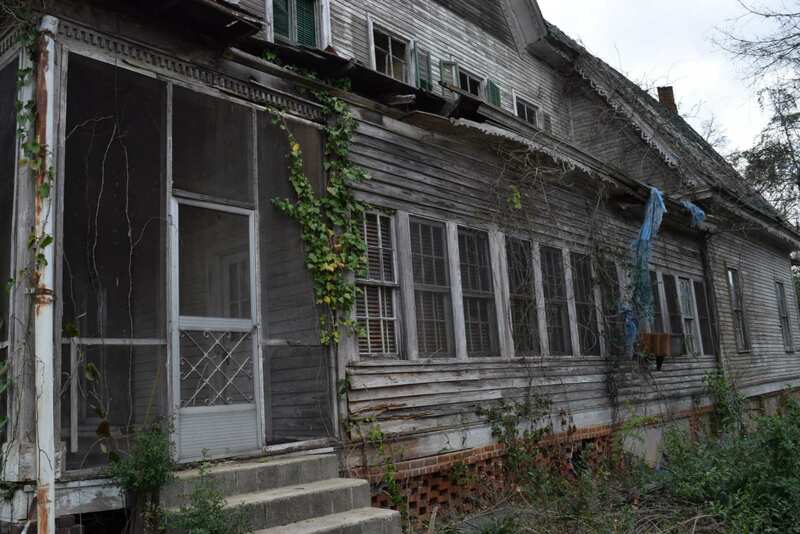 The ‘gem’ of the house was the rear enclosed porch, now sadly destroyed. This is where all the family get-togethers occurred. When we came to visit, there was always somebody arriving, usually with food. Second Floor. The four doors seen from the top of the stairs. On the right were two bedrooms with a common closet between them. 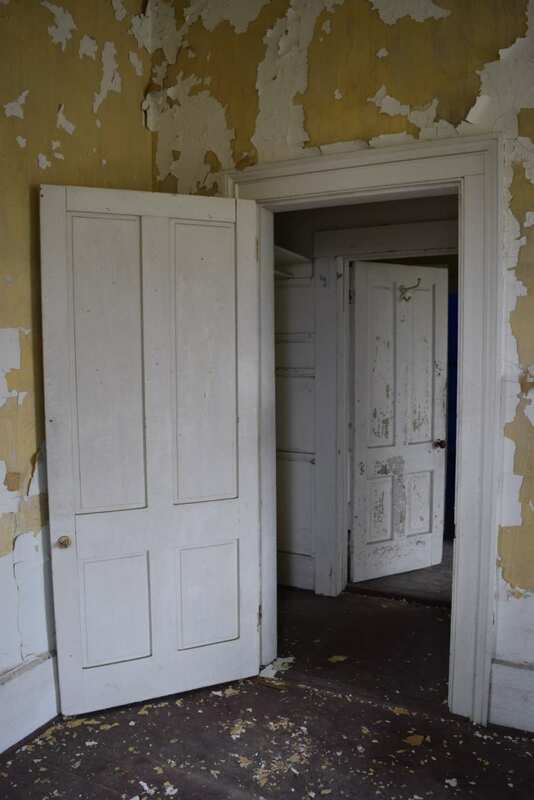 On the left, the first door led into a hall with a full bath and just beyond, the kitchen. The last room was a combination bedroom/sitting room. At times the second floor had a ‘transient’ resident staying, so we could not go up there. Any questions? My memory is not perfect, but I am going through photos to see if anything would be of interest. Photos from 1986 and one from 1960. From Kenneth, the home belonged to his grandmother for 40+ years. I’m going to do these in a few comments so it won’t be too heavy for the email notifications. Thanks for the update and the pictures Kelly. I am glad it is getting some love.